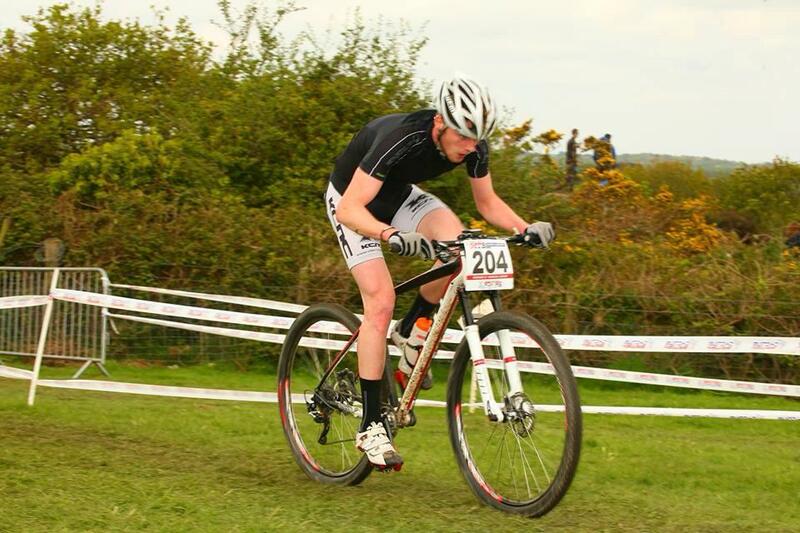 The Clee Cycles Race Team compete in XC and marathon races, as well as many enduros and 24hr events. We've just opened a Club Shop with our Team Kit manufacturer Impsport! This means you can now buy your own team kit whenever you need it!! 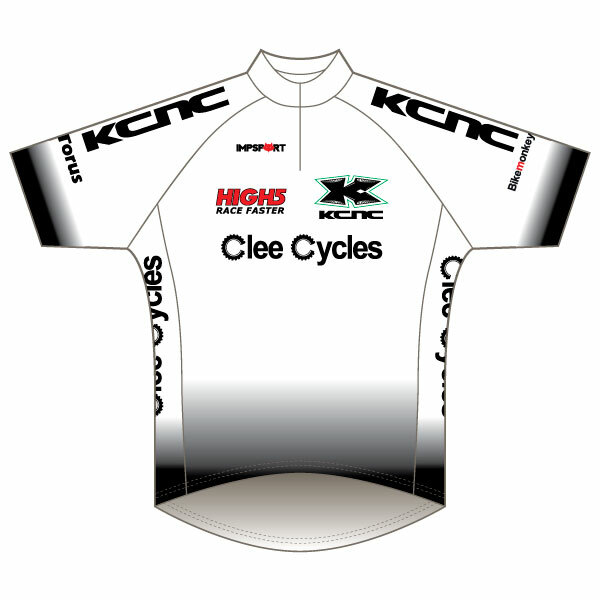 All club kit is custom made and will be manufactured within our current lead time of 4 weeks. If you have any special requests such as size amendments or certain date requirements please state in special instructions box or follow up email to sales@sportsandleisurebrands.co.uk, or call 01522 778805, where one of our team will be happy to help you. Nicky Morris (Expert), Ben Wadey (Expert), Andy Jones (Vet), Richard Samuel (Vet), Lloyd Bettles (Vet), Dave Winter (Sport), Arthur Green (Junior) and Megan Bettles (Juvenile). In the DH Team are Harry Turner (Jnr) and George Goodyear (Jnr). Sunday 10th May, Harlow Wood, Notts. Another trip East for the Midlands Champs Race and tough racing for Lloyd (5th Vet), Ben 9th Expert) and Nicky (18th Expert). Arthur faired better and won the Junior race with a storming performance just pipping Will Gascoyne on the line - well done Arthur - 2015 Midlands XC Champion! 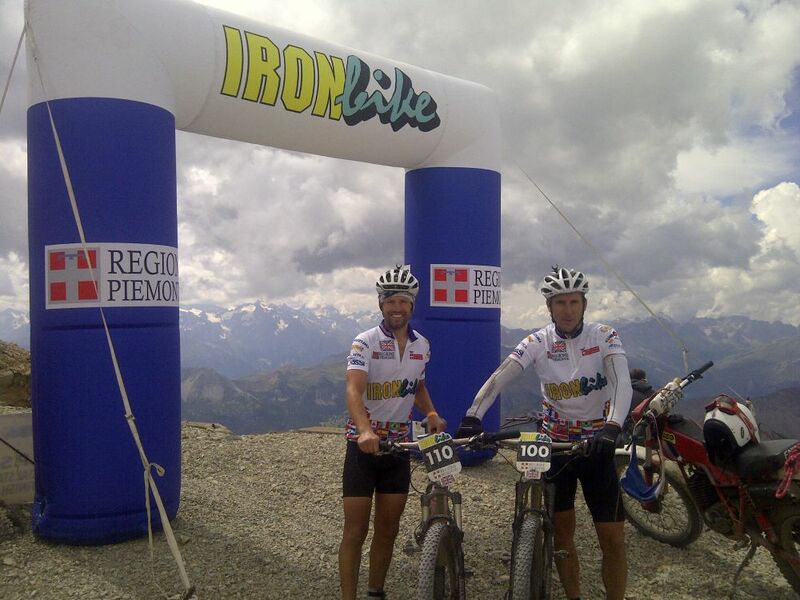 Andy Jones and Rich Samuel attempted Iron Bike for the 2nd time! We don’t know why. The first time hurt – during, and for quite some time afterwards! But the pain goes, and the memories of Alpine summits and unimaginable descents stay with you. So we thought we’d do it again – and do it better! 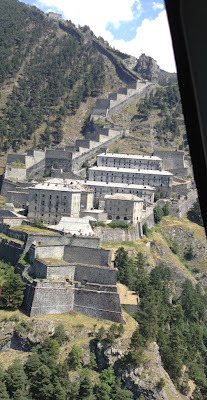 We didn’t drive there this time – we flew, and arrived in Limone Piemonte the day before the Prologue. This extra day meant we felt quite relaxed and fresh as we waited to sign on. 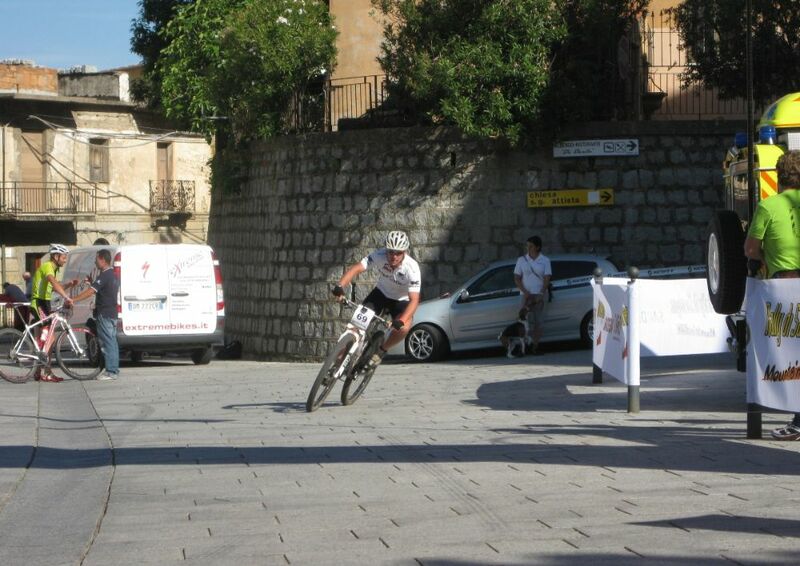 The Prologue was a spectacle for the start town – and started at 5pm with the locals lining the streets. 2 heats, and the top 20 riders from each in a final. We made the final, and finished as the leading pair! 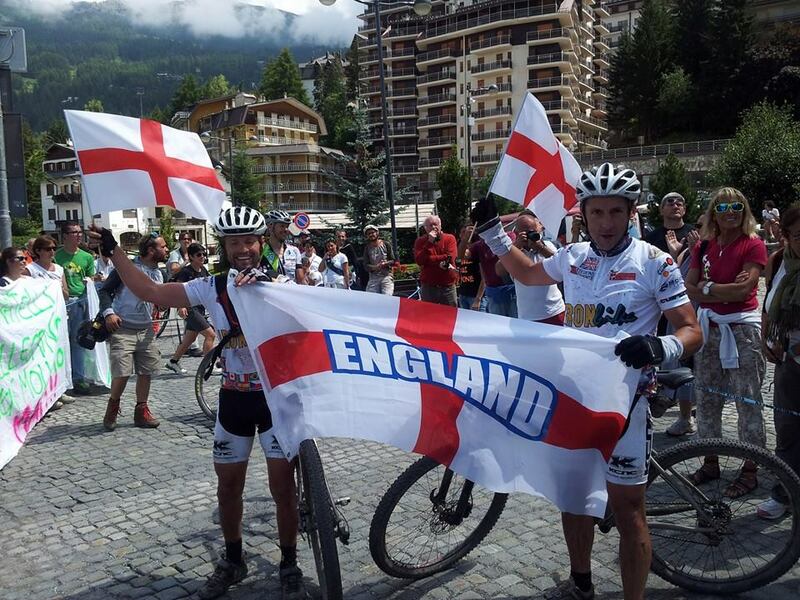 This meant being presented with the leaders jerseys – printed with the Union Jack – to wear on Stage 1. We were surprised – but enjoyed the honour and waited for the attacks to come on the first stage. 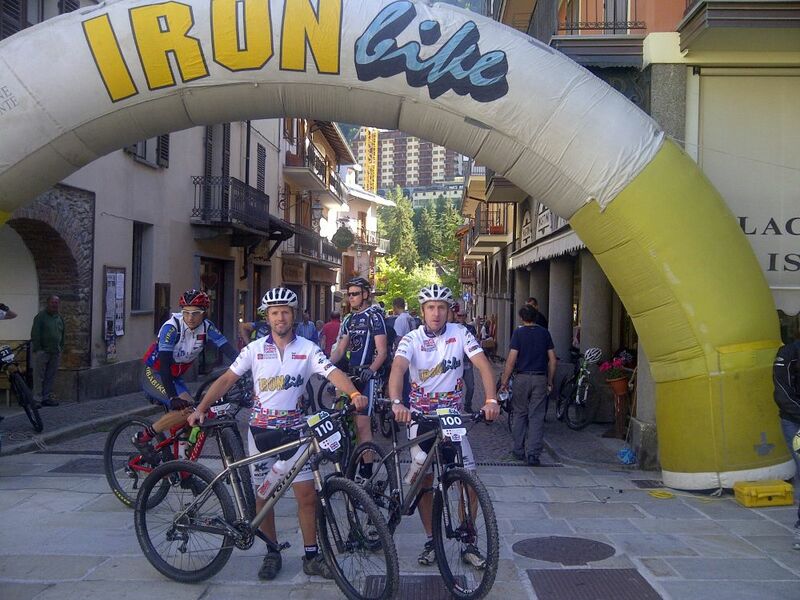 Stage 1 : Limone – Vinadio, 80km, 2500m, 6hrs target time, 9hrs max. Only 80km with only 1 mountain over 2000m – an easier start than 2012’s 140km stage – but it was still hard, and the thinner air at 2520m over the Colle di Valscura really hurt. We finished in 5h39m by riding through a lake of holiday makers sunbathing. The target time was met – you get points for every minute over the target time, and points for every minute you are slower than the fastest rider, you get disqualified if you are over the max time! 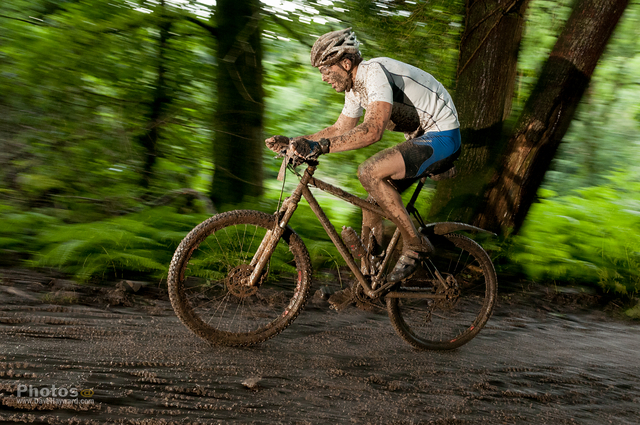 Within each stage are timed Special Stages (SS) where you race against the clock – the real racing of the event! Stage 2 was a long 135km with 4500m of climbing so we ate plenty and took and early night! We still lead the pairs race – so more leaders jerseys – and 25th and 26th overall (GC). 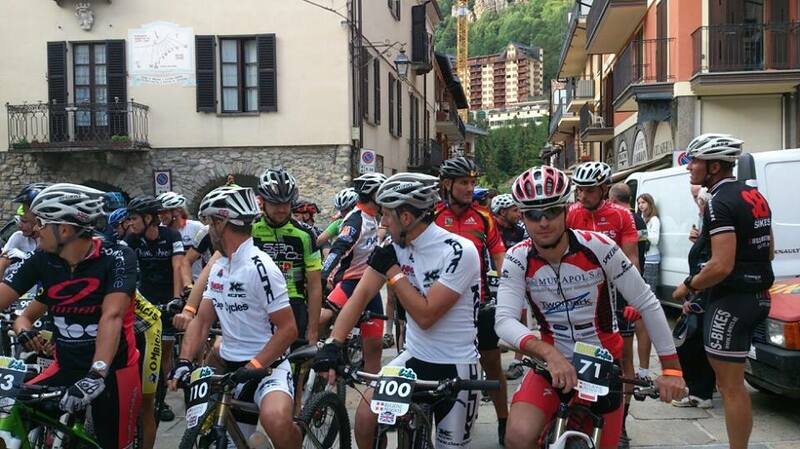 Stage 2: Vinadio – Cavour, 135km, 4300m, 10h target time, 15h max. The Colle Salsas Blancias at 2454m, shortly followed by Passo Gardetta at 2450m was the warm up - then Cima Bellino at 3000m, then just Colle del Prete at 1717m to finish. 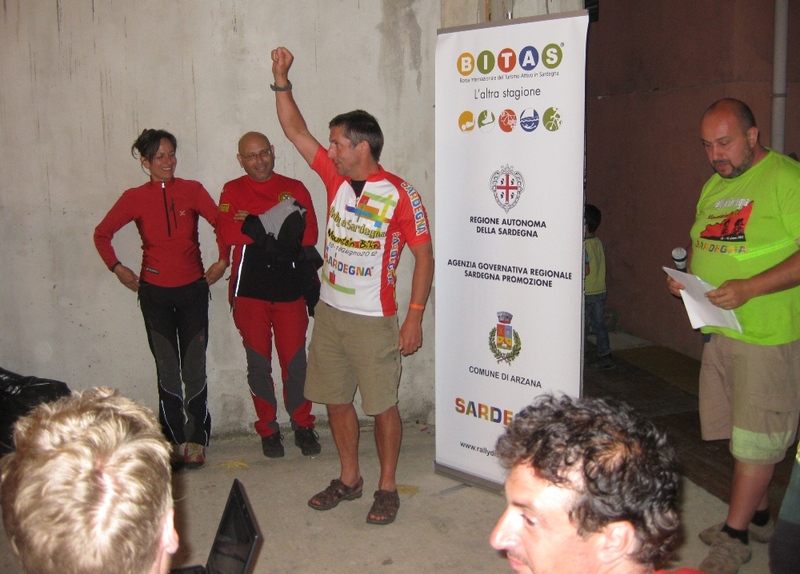 And the finish town of Cavour was way out of the mountains on the eastern plains and took forever to reach – eventually in 10h12m. This stage hurt – a combination of altitude and the 2nd day made summiting Mt Bellino really tough – you just seem to get slower and slower, and the trail longer and higher! The descent was fantastic, one of the best, but another Colle and the long run in Cavour meant relief as the biggest day was done! 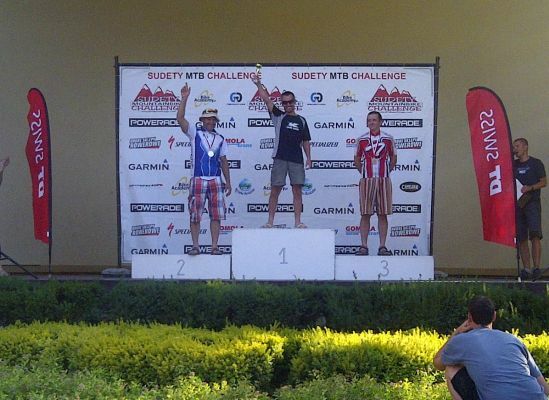 Some local cider and wine, lovely dinner – and 2 more leaders jerseys and 24th/25th in GC. Stage 3 : Cavour – Torre Pellice, 95km, 3700m, 8h target, 12h max. 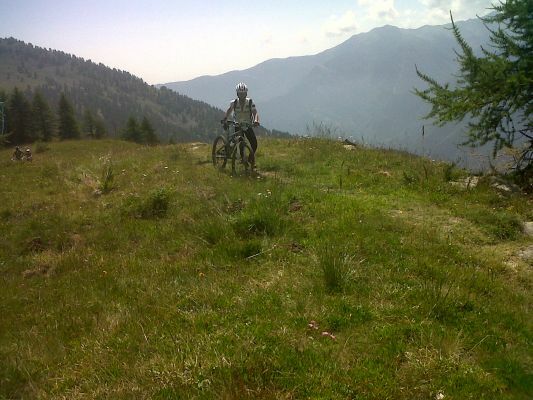 A short XC race was a surprise – 2 laps up and round the big rock at Cavour! Only 10km, but quite steep and some steps to race down! Then a couple of hrs climbing back up into the mountains – and our first storm. Just a bit of rain, then hail, then an hour of torrential rain/hail with thunder and lightening crashing below us. 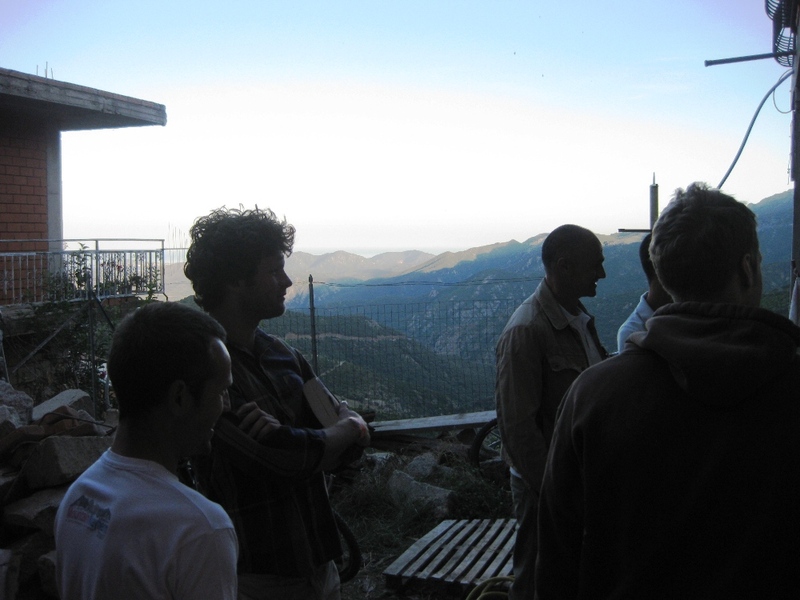 We’d reached Colletto Valanza by this point, and had to take shelter – and luckily the mountain top restaurant was open! After an hour almost the whole race were inside trying to get close to the fire, and using foil blankets to make winter clothing! Rumours were that the race would be stopped, but the radio cackled that the race was still on so we had to continue down the mountain as the rain eased a little. Not easy to get warm when you’re already shivering and soaked, and have to descend for 10km in the rain – no fun! The next feed stop at Villar Pellice was also the start of the next mountain, but the summit of Colle Chiot Cavallo at 2234m was deemed unpassable, and as the electrical storms were still around the stage was abandoned. 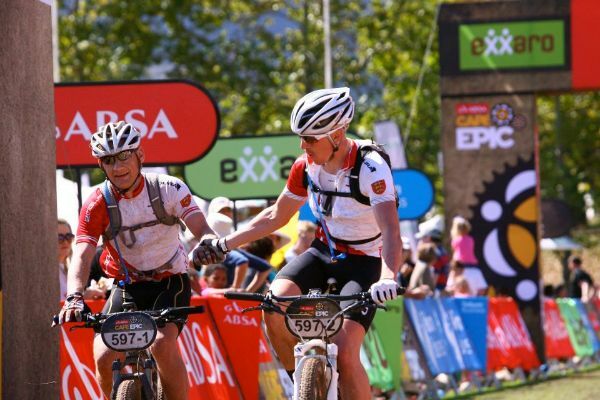 Disappointment – but also relief – and an easy ride to the finish meant only 64km and 4h44m. Fortunate really as the wet had destroyed the brake pads which would have made the last mountain descent impossible! Some time to clean bikes and go out for Pizza with Huw and Lou Thomas. 2 more leaders jerseys and 24th &25th in GC. Stage 4 : Torre Pellice – Pramollo, 70km, 3200m, 8h target, 12h max. Looked easy –but it wasn’t. 2 climbs up to Rifugio Barant at 2373m and then 2457m on the Colle Giullian looked OK – but south facing ascents up both was like climbing in an oven – I don’t think I’ve ever sweated so much! But a chair lift up to 2520m must mean a 20km descent to finish! Not on IronBike – the 6km of the roughest track down just lead to a tricky bit of rocky single track that was more than testing. 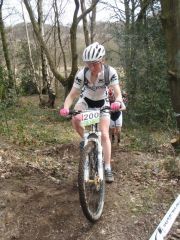 Then a crazy steep section and some classic IB single track through villages and gardens meant a time of 7h50m and 83km. A tough day – but rewarded by the local micro-brewery in Pramollo! We were still leading the pairs race, 22nd/23rd in GC. 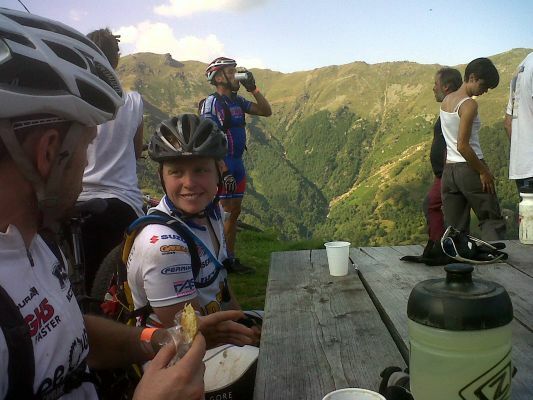 Stage 5 : Pramollo – Rifugio Selleries 70km, 3112m, 6h target, 9h max. A 500m ascent to Col Azzara was the warm up, then a race to the Coll Raccias at 2140m hurt the legs – we were now used to the altitude but that only meant we could go harder! An easy trundle up the valley to the foot of the Fenestrelle Fort meant the final race of the day up to the finish at Selleries at 2040m. It was hot – even in the trees – but a race is a race and we pushed to our limits all the way to the Refuge. We finished the final SS in 8th and 9th place overall! 5h50m and time made up on the GC riders. Dinner in the restaurant and a large beer to rehydrate! Still leading the pairs race, and up to 21st/22nd in GC. We now had the goal of top 20 overall! 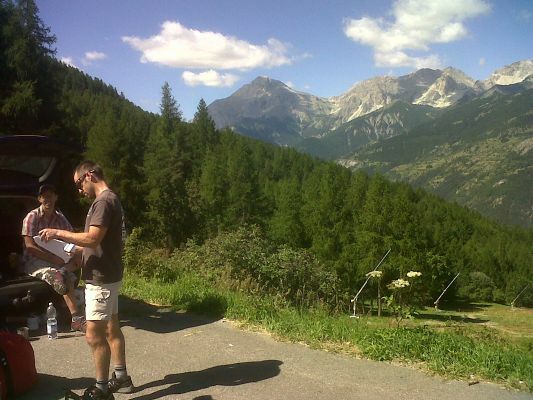 Stage 6 : Rifugio Selleries – Sestriere, 90km, 3000m, 8h30 target, 11h30 max. 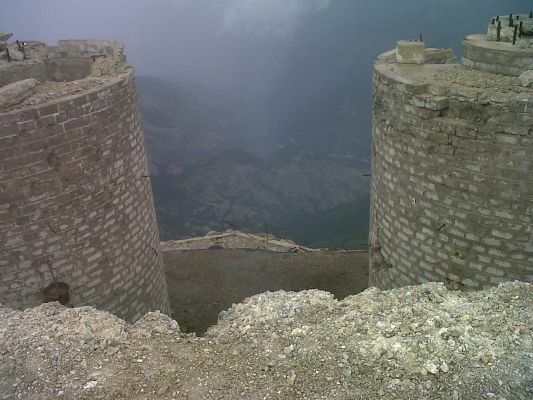 The infamous Fenestrelle Fort was the first timed stage – a few thousand steps, tunnels and ramps all inside an ancient mountainside fort. We couldn’t ride all of it – the arms just give up after 5mins of steps – so running and riding got us to the bottom in 14m08s. The fastest time an unbelievable 9m39s by the crazy Fin Kari Veikkolainen – and he crashed too! A couple of chair lifts and some more alps en route to the might Mt Chaberton. 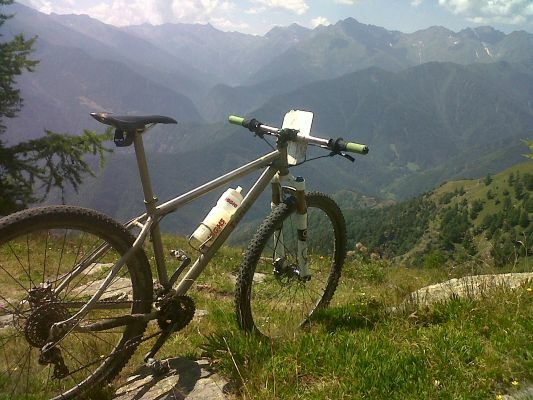 A 16km ascent up to 3110m – rideable for the fittest! It was harder than I remembered but a reasonable 2h34m for us, an amazing 1h49m for eventual winner Milton Ramos! A lift up to 1700m at Arrivo Pariol then a murderous final 10km up to the finish in Sestriere. Still leading pairs – and up to 18th in GC. 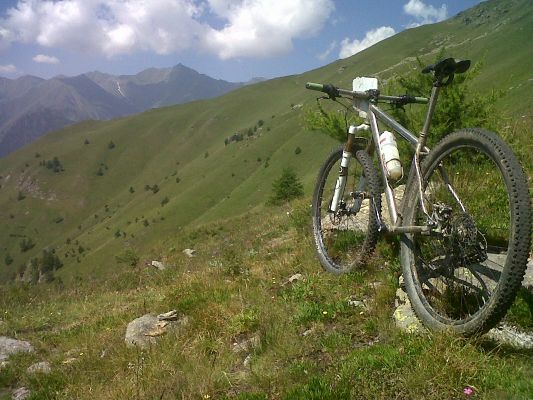 Stage 7 : Sestriere – Sauze d’Oulx, 60km, 2044m, 4h30 target, 6h30 max. 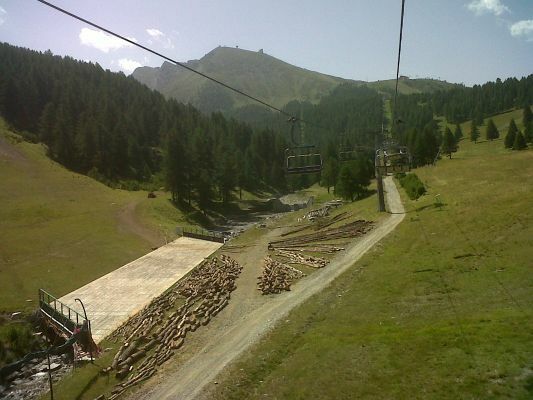 None of the forecast rain – so sunshine and a chairlift up tp 2707m for the timed 8km DH run. A couple of wrong turns, the first crash of the week and a dropped chain put us a lowly 18th in SS1, but the final SS of the Race was the hardest! A mere 1000m over 10km, then 6km descent. This was Huw and Rich’s last chance to beat eachother – so they raced like pros to the summit whilst I observed a few yards behind. Rich made the final surge and summited first, then Huw ran away on the descent as Rich was left suspended in a tree after crashing. 14th for Rich, 16th for Andy and 17th for Huw on that SS. That was it – except the climb up to Sauze d’Oulx – just as hard as any other – but ecstatic to cross the line. We won the pairs race and finished 18th and 19th in GC. Top 20 was the goal – and we did that. Winning the Pairs Race was a bonus – and fantastic – and certainly made the week! Iron Bike really is an emotive experience, and it really is hard to put down in words. Even after a week at home your head is still full of dusty corners and blue skies above horizons of jagged mountain peaks scattered with pockets of snow. The pain felt whilst riding is gone from memory. There is no recollection of sore feet, knees, forearms. Not being able to lift your kit bag can only be recalled at the airport check-in on the way home, yet we did it twice every day! We said we’d never do it again – and we have! Maybe we can get top 10 - next time! 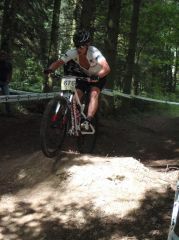 Sunny and flat at Sherwood - but it was great fun to race on! Experts and Juniors went first for CC RT, and an under the weather Arthur had to admit defeat after one lap suffering with a virus. James and Nicky went well with James sitting comfortably in 2nd place behind a flying Phil Pearce. The gap remained and James couldn't quite close it in 6 laps - so another great 2nd step podium for James showing great form! Nicky went well and managed to claw his way from 29th on the grid to 16th in a big, strong Expert field! Lloyd and Andy lined up side by side in the Vets race - 20th and 21st on the grid. The race was fast and both lost places on the the start to fast sprinting vets! But they both battled their way back up the field and Lloyd finished 19th, and Andy a few seconds behind in 21st! 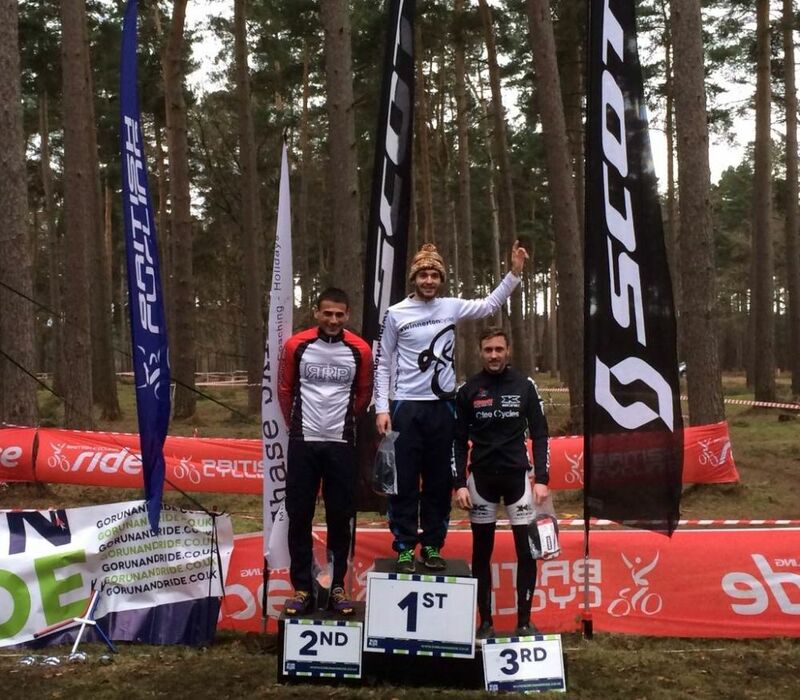 A brilliant Elite race saw the return of Liam Killeen - all in - a great day out! Sunday 29th June 2014 XC Marathon Church Stretton, Shropshire, England. Nice local event for the Clee Cycles Team and a good turn out. 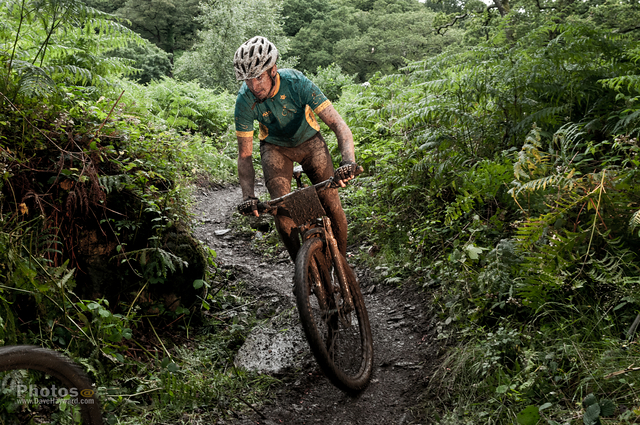 The trails soaked up Saturdays rain and were in fine condition for Sunday's 75km route. And what a cracker!! Some new bits and the highlights of old including a techy, slippery lap round Eastridge. Steve, Rich, Andy and Ben ripped round in just over 4hrs - not bad for Ben's first marathon! A great event with music and beer - well done CycleTec!! 15th June, 2014 Margam Country Park, Margam, Port Talbot, SA13 2TJ. A warm, muggy day for Rd3 at Margam, and a short lap that was surprisingly tough! First out were the Juniors and Arthur lost places at the start but rode strongly to finish in 9th place. Nicky Morris started well in Expert but the heat got to him and he slipped down to 24th place - not bad in a very strong field of 36. James Hyde punctured whilst leading so bad luck again for a form rider! The afternoon race saw the Masters lead out in front of the Vets. Steve Chapman put in some strong, steady lap times to finish 11th in the Masters race - Team ride of the day!! 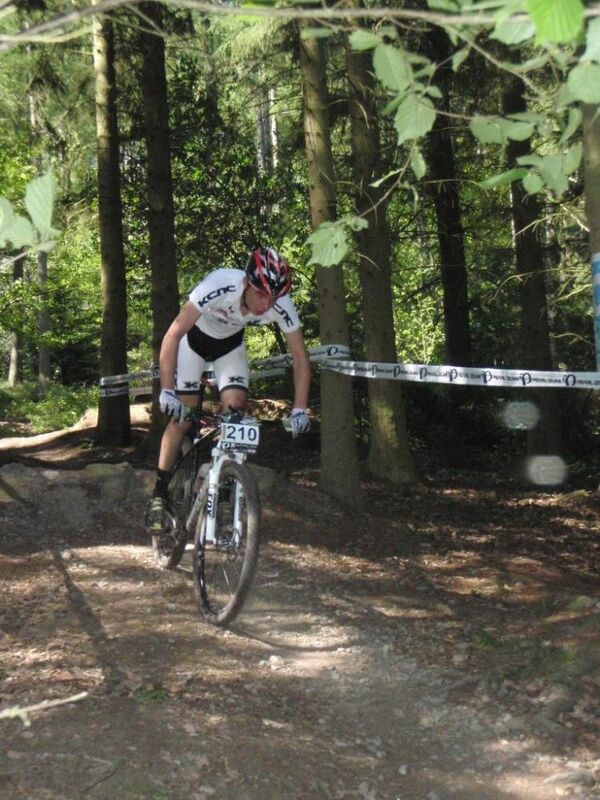 Andy lost places on the first lap and struggled to get back up the field - finishing 23rd. 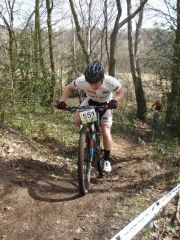 And a rare appearance for Rich Samuel in a Natinal race - he rode well to finish 34th out of a strong Vets field of 47. Lloyd suffered a broken chain on lap 1 - bad luck again! Sunshine in Shropshire - of course, and a good CC RT turn out saw Andy and Lloyd up first in the vets race. A small field meant they got a good start and Andy worked his way up to 2nd place after the first lap a mere 24seconds down. He managed to gain a coiple of seconds a lap, but back markers on the final single track meant the gap finished at 20s. Lloyd finished 5th. 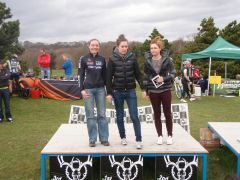 Sarra rode well and also podiumed in 3rd in the Female Sport Race. The afternoon race saw the Juniors line up with the Elite, Experts and Masters. Arthur Green produced teh ride of the day - with a good start he came round in 2nd place but a blinding second lap put him in the lead - which he held until the flag finishing a good 3 mins up - well done Arthur! Bad luck struck Micky Norris - again - with 2 rear flats ending his race after a lap. The bad luck hit Steve too on his last lap - also with a puncture! Ben Wadey started mid-pack in a good Sport field. He lapped consistently and climbed up to 6th place finishing only 2mins down on the winner. A good performance in only his 2nd XC race. Andy and Rich ventured north for the UK's only marathon race - and it was a bit damp underfoot! The rain stopped for teh race start in the Selkirk High Street, and was dry for the rest of teh weekend, but the previous day's rain made the woodland sections pretty techy! The route was similar to teh prevoius year's course - and it wasn't any easier! 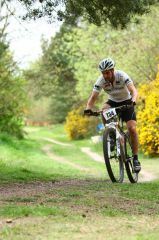 Andy finished in 4h43 and palced 9th Vet, rich a few minures later in 11th! Godd trainign for Ironbike!! 4th May, 2014. XC race. Wheal Maid Valley, Redruth, TR16 5HY. A long way south-west for the team - but certainly a course worthy of the miles! Technical descents, rocks, drops and climbs - and a bit of grass - and an extra lap!! The Juniors lined up ahead of the Experts and Masters, and Arthur Green got into his rythm early lapping consistently in 8th place - but unfortunately the last lap proved one too many and Arthur limped over the line in 15th. Experts followed and James Hyde lead the way with a sterling ride right from the gun. Consistent laps kept him a few seconds behind the leader for 5 laps but a strong last lap from winner Phil Pearce left James on the 2nd step of the podium - but still the ride of his life - well done James. A different hand was dealt to Nick Morris or puntured on lap 1. Lloyd and Andy lined up mid pack in the last race of the day - and both started with steady laps moving up the field helped by more riders retiring with flats. Lloyd finished a long 6 lap race 10mins behind the winner in 9th place, and Andy a minute later in 14th. The Vets must be getting faster!! Great course - and nice to see a proper race distance!! 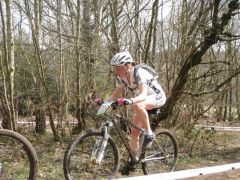 The sun shone for the 1st Midlands XC race, but the rain had been - and the first part of the lap was wet and muddy. But teh second part was fun!! A good team performnace from CC RT with 3 podiums. Sarra came 2nd in the Female Sport race - making full use of her mud treads! Andy managed 8th in Vets. The Expert and Juniors set off together and produced top rides from Arthur Green and James Hyde. Both produced good lap times and were just pipped into 3rd spot by some strong opposition. Steve Chapman put in 5 fine laps to finish 7th Master, missing 6th by a bike length. And the first XC race for Ben Wadey was a top effort with a 4th place from the back of the grid in Sport - well done Ben! DNFs for Lloyd - still suffering from illness, and Nicky with sick gears. 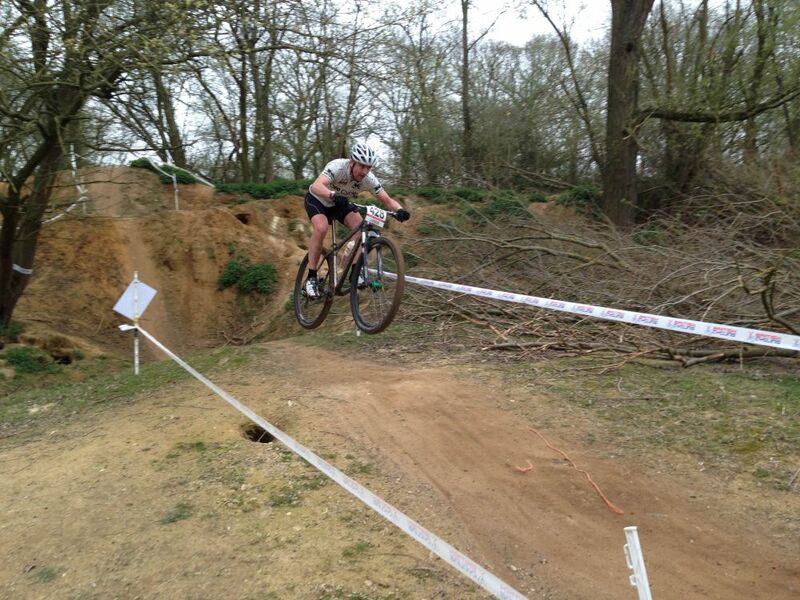 Saturday 19th April, 2014 - Easter Weekend, 4 and 8hr XC Race. Margam Country Park, Margam, Neath Port Talbot. SA13 2TJ Map and directions. 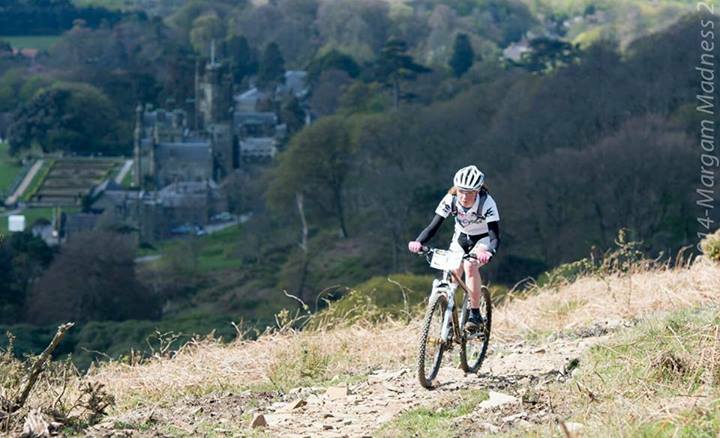 Margam Park was up to its billing of "World Cup Course" for the 2014 race - one of the best XC courses we've ridden! And the sun shone and the Clee Cycles Team turned out some top rides with Sarra and Martin finishing 2nd in the mixed pairs, Lloyd 3rd in the 4hr Vets, Andy 3rd in the 8hr Vets with Rich 5th. A great days riding - hope there's more to come from the venue!! 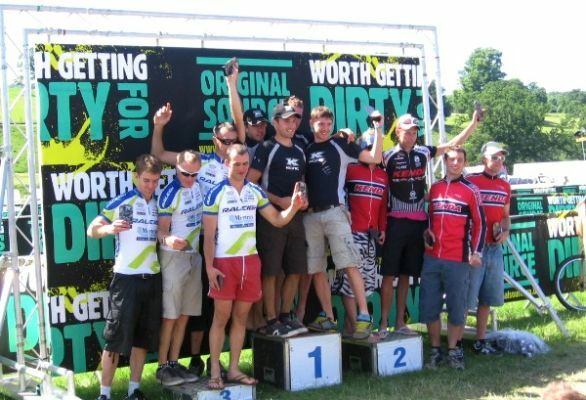 A warm day in Essex - and an early first round of the National Series came as a bit of a shock! 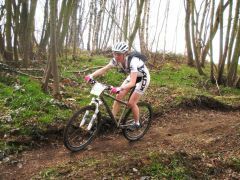 Touted as flat and easy - Codham Park proved anything but! First race for the team was the Elite, Junior, Expert, Masters race. Arthur was first off and found the course quite a challenge with cold legs. It took him a lap to settle - but then put in 3 strong laps to claw his way from the back of the field up to 11th place. James and Nicky started at different ends of the grid - with James placed 9th and Nicky 52nd. James showed some good form with the team ride of the day - maintaining pace and finishing an excellent 5th. Nicky struggled after a good start with the course proving far more demanding than it first appeared! And Rooky Master Steve Chapman showed some steady pace starting from the back of the grid and riding up to 23rd in his first XC race! Things didn't go as well for the old boys - Lloyd had good early speed but a bumpy course took its toll on Lloyds painful ribs following a crash the previous week. 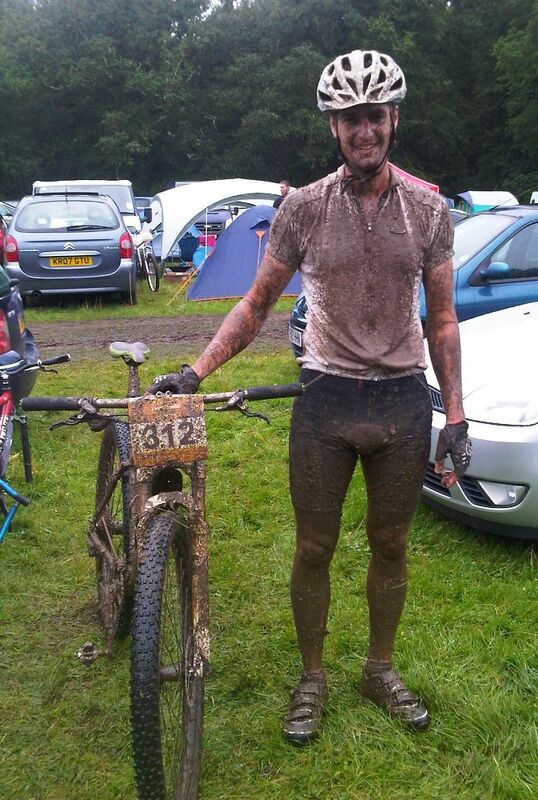 Andy sufferer too, but from a lack of race fitness - and struggled over the line in 33rd place, ten behind Lloyd. The course was hard work - but it was fun, and nice to see something different! Nice dry race to start the season, but a mixed bag for the CC RT. Arthur was first out in the morning and podiumed in 2nd. Sarra, Nicky and Andy race in the afternoon with Nicky loosing his seat on the first lap, but finding a replacemnt on lap 2 and getting back up to 3rd. 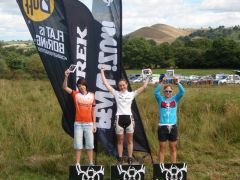 Andy punctured twice so limped over teh line, and Sarra finsihed 5th in the ladies. 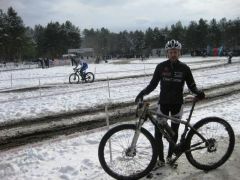 Only Lloyd ventured south to the Olympic XC venue - and was pleasantly surprised to see how technical it was. A real test of nerve and skill - never mind fitness! After a couple of sighting laps the day before he was confident starting the race. 6 tough laps were raced and an 8th place was an excellent result in the hotly contested Vets class. Another local race, if you live in Shropshire, but Lloyd and Sarra made the trip to the Shropshire Hills, Nicky and Andy walked. 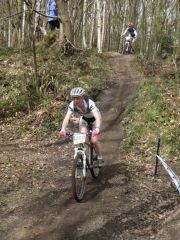 Eastridge is classic "old school" XC with big climbs and natural singletrack - made a bit more interesting with an early shower! Andy and Lloyd were off first, both with eyes on the podium! They both rode sensibly up the long first climb and then started passing over the top. Andy didn't quite make the jump into the first descent and got held up all the way to the bottom which put him a couple of minutes behind the leaders. He managed to climb back up to 5th but was never going catch the front. Lloyd did get away but broke his chain on lap 2. Years of experience allowed him to repair it, and he rode hard back up to 9th. Sarra started with the podium and the Series in mind. She sat comfortably in 2nd for the first lap, then took the lead and held a steady pace to end to take the win, and with that the Series win - well done Sarra! Nicky Morris was last out and started on the front row of the Sport grid. The perfect start saw him take the hole shot and lead into the single track climb. Good form from the Sudety Stage Race saw him complete lap one with a couple of minutes lead, and he then rode well until the end of lap 2. As he attacked the corner into the finish arena he approached the set of doubles just a bit quick and launched high over the second and landed in a pile. Luckily no one saw it, at least that's what we told him, and he got back on and put in another 2 steady laps to take the victory, and his first win of the year! 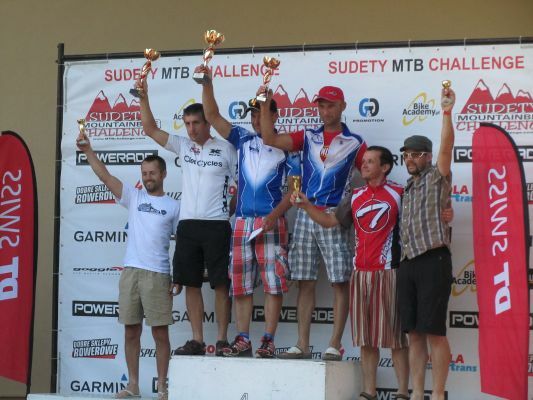 The Sudety MTB Challenge is a Central European 6 day stage race in the Sudety mountains on the Poland/Czech border. This was was the 9th edition of the race in a mountain range peaking at 1602m – not the Alpes but high enough for racing mountain bikes! The Clee Cycles KCNC team sent 7 riders – Andy, Ben, Dave, Joel, Nicky, Rich and Rob – and they opted to drive the 1100 miles to the start town of Kudowa Zdrój, Poland. We planned 2 days to drive – but hadn’t planned the heat wave over central Europe – 36 degrees all day, and even hotter in Kudowa! 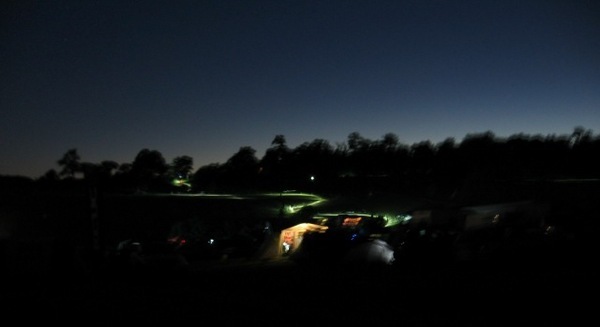 We arrived Saturday evening with the Prologue starting at 2pm Sunday. Prologue : 8.0km, 480m ascent, Difficulty (1-6, 1 = easy) 2. 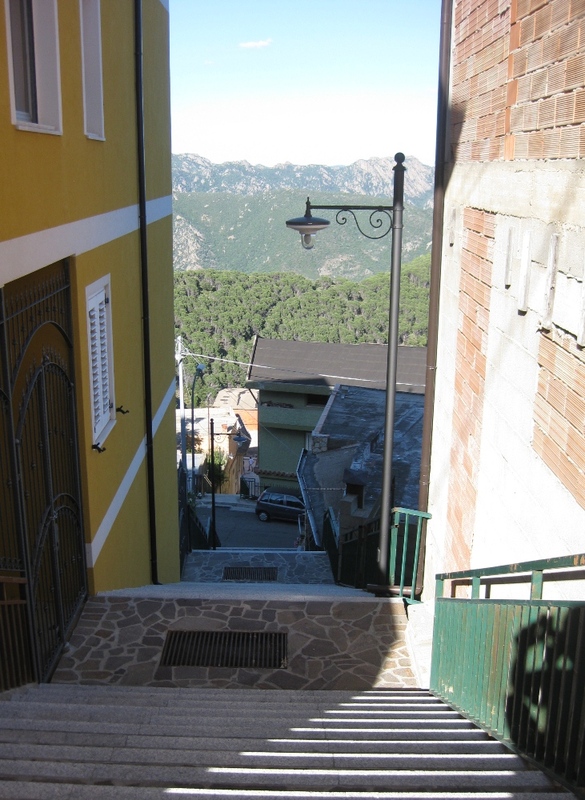 An “easy climb out of the town” was how the start was described – but a morning reccy made us think we were not on route! No road or fire raod – just steep, dusty singletrack, barely rideable rooty pitches, off camber ridgeline traverses, and a mile of 20% tarmac to finish. Difficulty 2?? And it was hot – 43 degs in the sun, 36 in the shade. 8km against the clock proved to be one of the hardest efforts the team had ever attempted – deep breaths were hard to find! Everyone pushed themselves, but the heat was limiting, and only Rich Samuel put in a top TT finishing on top of the Masters (40yrs +) Podium. Prologue Result : Rich 1st in class (14th Solo overall), Ben 14th (15th), Joel 22nd (24th), Andy 4th (28th), Nick 45th (56th), Rob 46th (57th) and Dave 59th (79th). And for the record – Rich was 4m44s behind the winner Tomáš Vokrouhlík (BMC- SAVO racing team [CZE]) who was 2mins faster than 2nd!! A couple of recovery ice creams later, and a tasty meal of meat, potatoes and cabbage – and we were all set for the following day’s first full stage. Stage 1 : Kudowa to Kraliky (Cze), 89km, 2101m ascent, highest point 857m, Difficulty (1-6) 3. A mass start with the top 40 riders gridded into 2 pens at the front split the team in amongst the 200 riders. Very hot again – and a relief to get moving. We soon linked up during the neutralised first few kms – with Rich riding like a champ – desperate to protect the Masters Maillot Jaune. His early pace proved foolish – Andy lost him after 3hrs, but the rest of the team luckily found him lying in a ditch uncontrollably vomiting over himself, deliriously requesting to be left there to sleep! Dave nursed him back to the finish – and incredibly he crossed the line on 2 wheels! But the heat got to everyone with Ben also suffering with heat stroke! Stage 1 Result : Andy 3rd (23rd) 40mins behind winner, Joel 23rd (27th), Nicky 40th (51st), Ben 43rd (54th), Rob 44th (55th), Dave 47th (59th) and Rich 48th (60th). A recovery meal of meat, potatoes and cabbage and an early night due to a lot of lightening and rain! 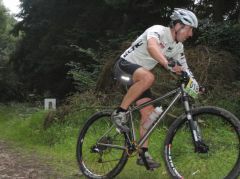 Stage 2 : Kraliky – Stronie Slaskie, 80km, 2614m ascent, highest point 1276m, Difficulty (1-6) 4. A wet start was welcome for most of the Clee team – warm and wet – just like Wales! More climbing on this stage with the peaks in sweaty, muggy cloud – but the slippery roots and rocks suited the Brits! Andy and Joel lead the team completed a strong stage well. Stage 2 Results : Joel 14th (16th) 47mins behind winner, Andy 3rd (17th), Rich 5th (36th), Dave 33rd (38th), Rob 34th (39th), Nicky 35th (40th), Ben (sick note) 54th (66th). A recovery meal of meat, potatoes and cabbage – and no pudding sufficed for a couple of hours, then beer, chocolate and peanuts before bed. 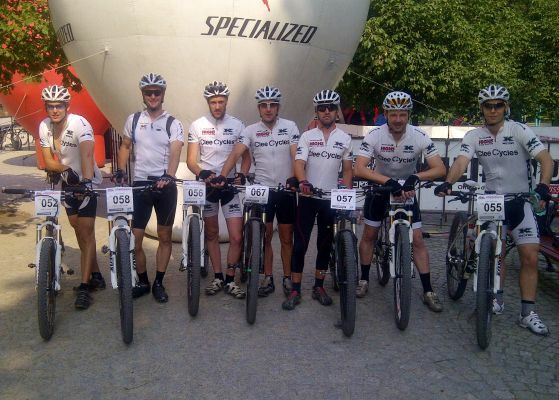 Stage 3 : Stronie Slaskie – Zloty Stok, 60km, 2024m ascent, highest point 1117m, Difficulty 5!! This had been highlighted as the most technically difficult stage – and it didn’t disappoint! Nice flowing trail to the first summit – then 25km of undulating forest single track – but it was tough! More roots than you can imagine, and when they abated – rocks! The climbs were barely rideable, the descents technical – so difficult to carry any speed! It was good fun for 10km – but then became torture as the heat and tired legs drained you enough to take your eye off the trail and start making mistakes! 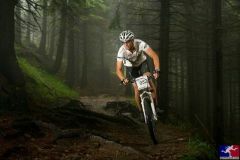 For this reason it was a shorter stage – but still 4hrs + in the saddle – though tough mountain bikers were heard winging like seasick sailors! Stage 3 Results : Andy 2nd (14th) 41mins behind winner, Joel 20th (22nd), Dave 21st (23rd), Rich 4th (27th), Rob 27th (31st), Nicky 28th (32nd), Ben (sick note) 51st (63rd). A recovery bus ride to our luxury Polish Castle and a recovery banquet with pasta and no potatoes, followed by a swim in the spa pool and relaxing hot tub put us in fine fettle for stage 4. 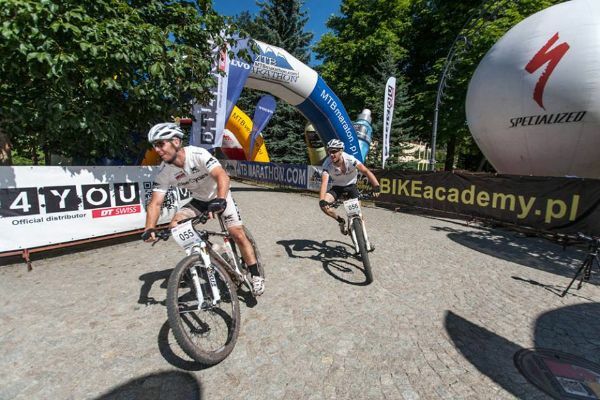 Stage 4 : Zloty Stok – Walim, 73km, 2501m ascent, highest point 1009m, Difficulty 5. A strong stage with a history of “accidents and falling downs” proved to be quite fun with miles of sinuous “groovy” trails to start – and the Clee Cycle Groovy train in full effect! But true to tradition – a train queue at the top of a steep rocky shoot sent Andy sideways and Dave over the bars – landing painfully on a fallen tree. A strong finish from Rob and Rich put them at the front of the disbanded Clee train! Stage 4 Results : Rich 3rd (14th), Rob 13th (16th), Andy 4th (17th), Nicky 23rd (27th), Joel 30 (37th), Ben (sick note) 53rd (72nd), Dave (punctures) 54th (73rd). A bus ride to deepest rural Poland was a slight come-down after the previous 5 star accommodation – but spageti was a welcome change! 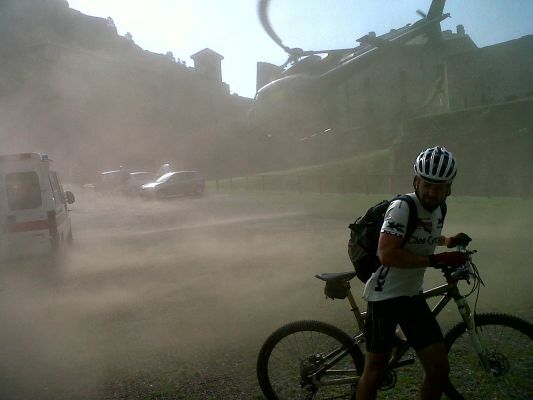 Stage 5 : Walim – Kudowa, 79km, 2267m ascent, highest point 871m, Difficulty 5. The final stage was another “strong” stage. But as always – the last stage was a race to the finish! Andy started in the leaders pen and didn’t see the Clee team until the end, but Nicky put in is best day of the week until he missed a turn on the final climb and had to retrace his tracks until he ran into Joel. They finished together, fittingly racing each other down the route the Prologue had climbed! Joel even muscled Nicky in the last corner of the arena as sprinted for the line! Rob, Dave and Ben finished strong, but Rich had 3 encounters with the broom wagon as 1 early puncture turned into 3, and he was the last man on course at the first feed stop and had to wrestle his bike back off the marshals in the broom wagon as they threatened to drive him to the finish! But he did finish, albeit 2hrs late! Stage 5 Results : Andy 2nd (17th) 47mins behind winner, Joel 27th (33rd), Nicky 28th (34th), Rob 36th (42nd), Dave 42nd (48th), Ben (sicknote) 51st (65th), Rich (mechanically challenged) 13th (68th). A couple of giant fruit sundaes in the Sissi Café at the finish really caped off a great week. Then some of the only cold drink available in Poland – beer! And a buffet/bbq/banquet – prefect! 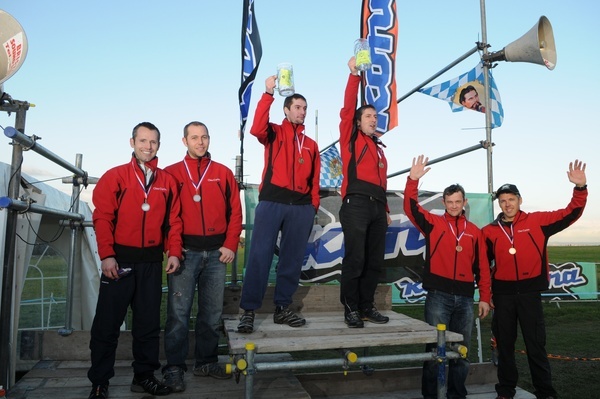 Final Results – in Class (overall solo): Andy 2nd Master (13th), Joel 22nd (25th), Rob 25th (31st), Nicky 28th (34th), Rich 6th Master (39th), Dave 39th (47th), Ben 46th (58th) Race Winner : Tomáš Vokrouhlík (BMC-SAVO racing team [CZE]), Andy was 3h28m behind! 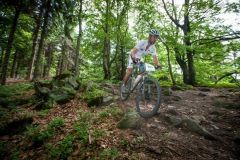 The Sudety MTB Race is a true mtb race – classic XC riding in medium height mountains. Race organisation was excellent, the hotel accommodation interesting but very good. An area definitely worth a visit – and if you like racing – it’s a “strong race”, or what we’d call a hard race – and well worth doing. 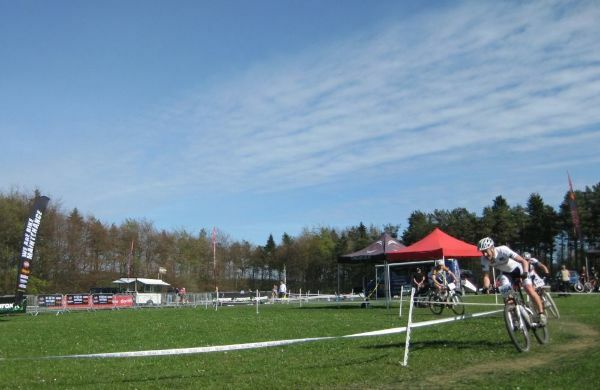 We might go again, or we might try the Beskidy Race from the same organisers! Saturday 8th June, 2013. XC Marathon Race, Selkirk, Scotland . Only Andy made the trip to bonnie Scotland and a clear blue sky greeted the riders as they lined up in Selkirk High Street for the 2013 Marathon Champs Race. A fast lead car for the 6km neutralised start soon got the blood pumping before the first long climb of the day. 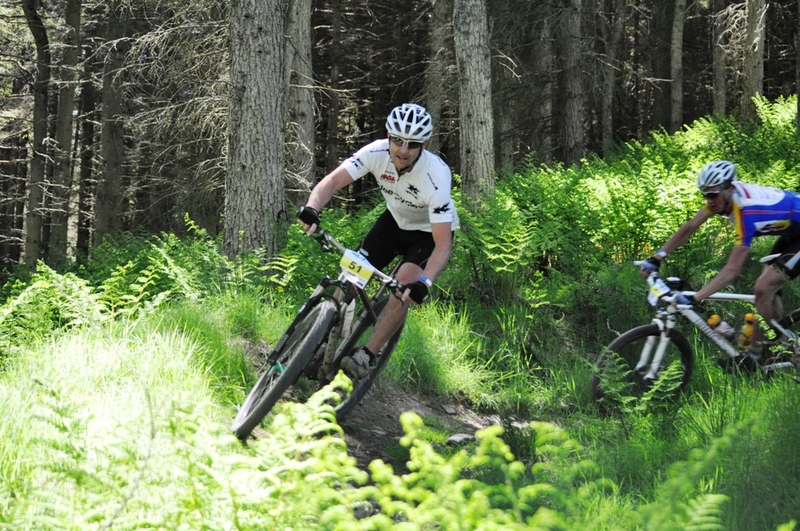 The course was similar to previous years - but with an extra descent before the Innerleithen climb. After a couple of hard hours the cramp twinges started and the pace dropped as I limped up teh climb and tried to keep pedalling to teh end. A hard ride of 4h21m, 9th Vet and 32nd overall 39mins behind winner Neil Crampton and 32mins behind a flying Veteram Marathon Champ Ant White! Great riding, great place, great race - see ya next year! The sunshine took 6 CC riders to the Midlands Champs. First out was Sarra in the Womens Sport race and she put in a great performance to finish 2nd in the race and the Champs. The Vets were also out early and Lloyd put in consistent laps to finish 6th with Andy in 7th. Ron retired with an injury. The afternoon sun greeted Joel, expert and Nicky in Sport. Both put in a good performance and both finished a credible 5th place in class. Great course in "the wyre" and nice to do a local race! 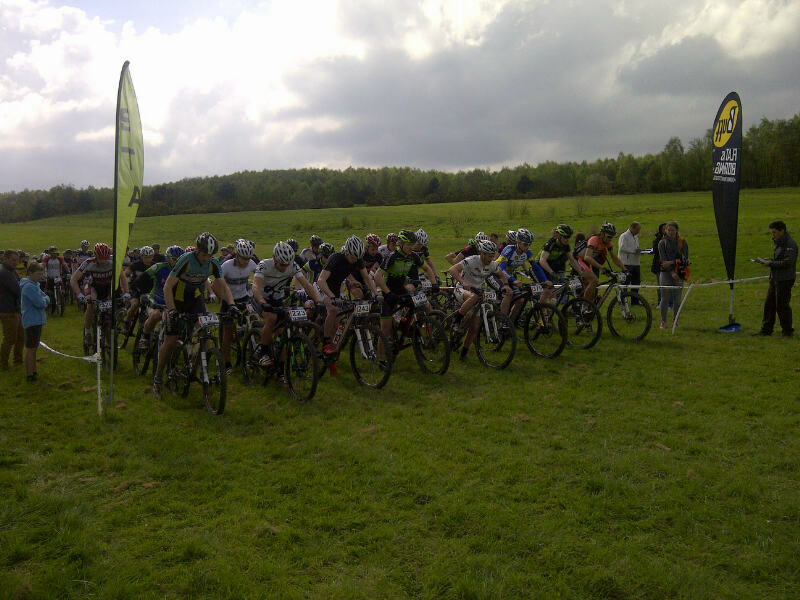 Sunday 5th May, 2013, XC Enduro. 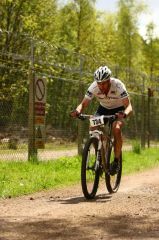 Great conditions this year made for a fast race even with the last km of un-ridden trail. Chris Coombs finished first for the CC RT in 2h52, 26mins after Nick Craig and Jonnie Pugh. Joel was next in 2h52, Rich punctured and finished in 3h08, with Rob recovering from injury 5mins later. The Gorrick Kawasaki 100 underwent a change of venue this year and took place a Porridgepot Hill near Deepcut. The course took in much of the xc course that we all know, but also contained a number of new sections to build it up to a 10 mile lap. This was the second round of the Endurance Series, but the first long enduro for Ben Jones and Dave Winter, who lined up to tackle the full seven laps for Clee Cycles. A steady start saw the Clee riders settle into a comfortable rhythmn, slowly picking their way through the field. There was plenty of rolling singletrack to keep the riders entertained and the dry weather helped to make for some fantastic riding. Despite the lack of big climbs, the course began to make itself felt and by the 80 km mark, the legs and back began to suffer. The last 30 km were tough and both riders had to dig in. Dave crossed the line first to finish the 113km race in a time of 6:33:33, in 13th position. Ben arrived shortly after in 6:34:44, in 15th place. A good hard race! 28th April, 2013. XC race, Wheal Maid Valley, Redruth, TR16 5HY. Lloyd and James journeyed South West to sample the delights of Cornwall. A very technical, rocky course made for some great racing. 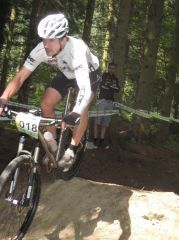 Lloyd finished 13th of 60 Vets, and James rode very well until a last lap disaster put pay to a top 6 finish - unlucky! Andy, Joel, Rich and Nicky decided to head up north for some extra endurance training! A long way - for crap weather. Non-stop rain ruined what would have been a great race, but driving rain and wind made it extremely cold and very difficult to race hard for 3+ hrs! All 4 riders started well, but suffered with the amount of climbing with cold muscles. Andy Punctured on lap 2 but they were all back together by the final climb finishing in a tortuous 3h53m in 27th, 29th and 30th place. Joel retired after 2 laps finishing 4th in the 2 lap race. Disappointing results in very disappointing weather! See the lap on Strava! Lloyd and James enjoyed some dry racing down south, Lloyd finished 6th in the Vets, and James a credible 6th in the combined Elite/Expert class. 13th & 14th April, 2013. They forecast wind and rain for Saturday and Sunday - and they were right! The first hour of Sunday's Marathon was good but as soon as we climbed up and into the head wind it rained harder and blew harder - virtually walking pace for an hour in to a gale force head wind and over soggy, sapping, wet grass - one of the toughest hours spent on a bike! The route seemed shorter - which was a relieve - but it still took Nicky and Andy nearly 4 hrs. Joel, Rob and Chris Coombs came shortly afterwards - well done everyone who finished! See the ride on Strava! Sunday 14th April, 2013. XC Race, Birchall. Warmer and windier in the north of the Midlands - Lloyd and Sarra made the trip. It was a tough hilly course, made harder by the slightly boggy/sappy ground and the gale force winds! Lloyd raced 52 vets and put in 4 solid laps to finish 4th - less than 2 mins off the podium. In the women’s Sport Race Sarra got stuck in a pile up at the top of the first climb on the first lap, a few riders were blown off by a big gust of wind, which meant she missed the break. She spent the next two laps chasing the leading two riders and caught them in the final lap. She then passed them both - but a mistake in the woods brought them back and dropped her to 2nd. That just left the last fireroad back to the finish – and the sprint was on between the top 3. Unfortunately Sarra didn't quite have the speed and got pipped into 3rd. A great first race of the season – well done Sarra! The final round of the Gorrick series was held at Frith Hill, where Ben Jones and Dave Winter were both looking to improve their series standings. 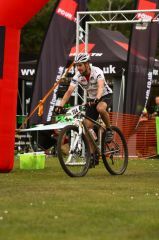 Here's what Dave had to say: "A good turn out and a poor grid position saw me boxed in as we entered the first singletrack somewhere near the back of the pack. With little opportunity to pass i had to wait till the course opened up, and put in some big efforts to over take some of the large packs of riders up the fire road sections, which saw me start to make my way through the field. A bone dry course made the racing fast, with a cracking course laid out with plenty of twisty single track and sharp climbs, the freezing conditions of the last round where soon forgotten. With lots of good racing on offer I put my head down and aimed for the next rider in front. The last lap saw cramp building and I conceded two places theat I'd just gained, so I had to slow up and the cramp eased allowing me to push on and catch the riders back up and battle it out to the finish. Missing a pass on a slower rider before the last singletrack left me with to much to do in the final sprint and had to settle for 7th". 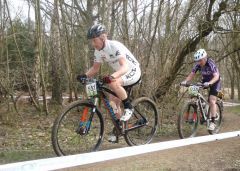 Here's what Ben had to say: "I made a pretty good start and was nicely positioned as we turned off the start straight and headed towards the singletrack. But a dropped chain, sent me straight to the back of the pack. 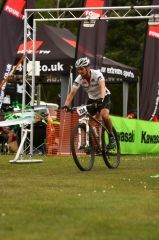 Worse was to come when my bars cam loose and I had to limp round the rest of the first lap. Thanks to the spectator, who lent me a handy multi- tool and helped me back in the race. I pushed hard and caught the tail end of the race, only to drop the chain again, which cost me even more time on the second lap. I worked my way back through the field and managed to finish in 9th position in the end. Considering the mechanicals, I was happy with that". All in all, a cracking day and a great race to finish the series. Cold and dry in mid-Wales - makes a change! A tough 80km loop was marked out and ripped up! A great days riding with classic Welsh trail in great nick! Rich, Rob and Andy finished 2460m of climbing with weary legs - a stark reminder of marathon distance! Check out the ride on Strava! 24th March, 2013. XC race, Sherwood Pines Forest Park, Kings Clipstone, Mansfield, Nottinghamshire, NG21 9JL. The race was on, and we braved the snowy roads to get to Sherwood. 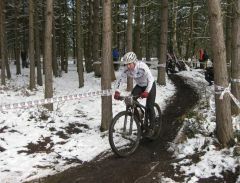 Very cold, muddy and snowy but the course rode well - with limited overtaking! Nicky and James were out first and both had to concede to chain failures - James on lap 1 and Nicky on lap 3. Terrible luck but Nicky ran the best part of the last lap to finish 30th from a starting position of 55th. Andy, Lloyd and Rob lined up next in a huge Vets field of 111 riders. Lloyd suffered the difficult conditions and finished 14th from 21st on the grid. Andy had a comedy moment of a stick through the front wheel on lap one, but managed to fight back to 24th from 60th on the grid. Rob suffered a holiday hangover having been off the bike for a couple of weeks. A very tough start to the racing season - but that's racing! 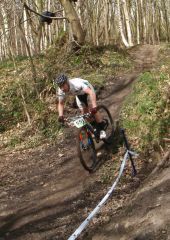 Sunday 24th March, 2013, XC race, Porridge Pot Hill, Deepcut, Surrey. Dave Winter made a lone, special effort for his first race of the season and put in a good show to finish 5th in the Sport race. 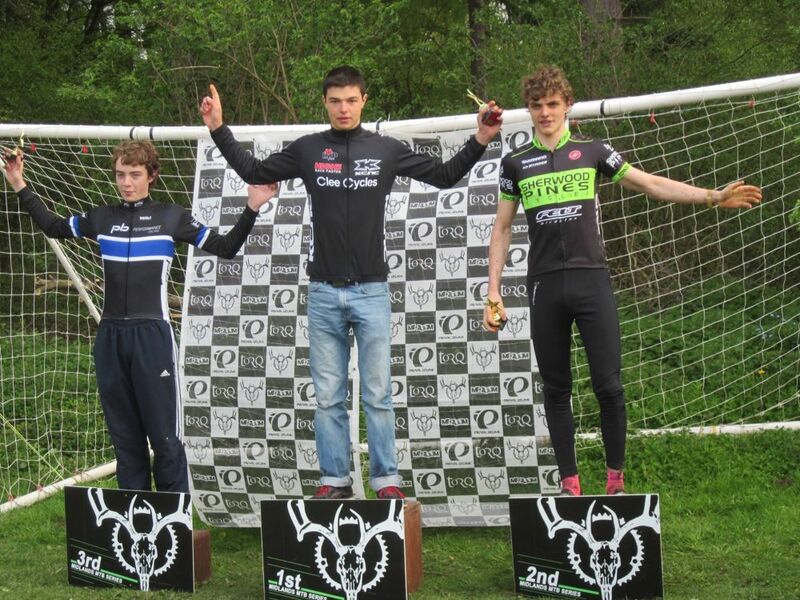 James Hyde started the season well with a win down at the Eastern XC Series race. Good prep for the first National - well done James. 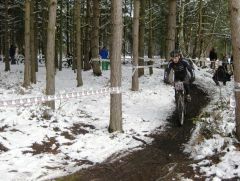 First race of the "non-winter" race season - and it was still winter! Andy, Lloyd and Nicky raced but the latter two were not on form! Andy went well and finished 9th out of 70 Vets, Lloyd retired after 2 laps suffering from a cold. Nicky raced a big sport field and limped round to 8th place. Good fun all the same with the first National a week away! Nicky Morris too fast for the lens! Why don't phone cameras allow you to control the exposure? 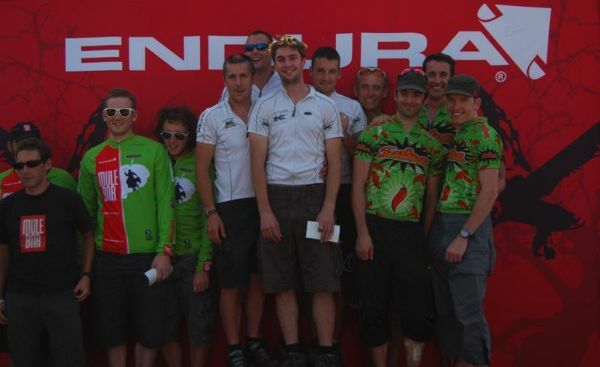 Sunday 10th March, 2013 50km Enduro. Wentwood Forest, Llanvaches, South Wales, NP26 3BE. 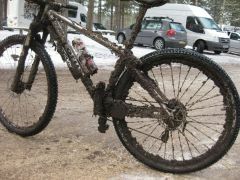 Another freezing Wentwood - but top riding in the woods with some sensible single track picked out to give decent trail conditions. Andy, Joel, Nicky, Sanchez and Rob braved the temperatures. 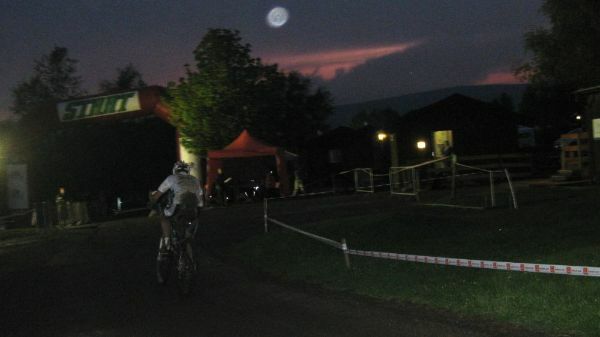 Joel and Rich were first back in 3h10m, just 15mins after the first rider. Andy followed 12mins later, then Rob 4mins later. Nicky limped back after an puncture and "loosing his bottle"! 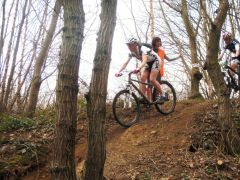 The 3rd round of the Gorrick Spring Series took the riders to Crowthorne wood; a popular, relatively flat and fast course. Ben Jones lined up for Clee Cycles in the Masters category - here's what he had to say: "The race was flat out from the gun and the first lap was more about staying with the leading group, rather than finding a comfortable rhythm. But I soon settled down and was sat in 3rd position going into the final lap. But the early pace told a bit and I didn't have the legs to hold off Dean Camier towards the end. 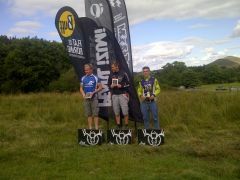 I had to settle for 4th in the end, 28 s off the winner. Good race." Sunday 24th February, 2013. XC race. Cold and dry, and cold - very cold at Cannock Chase but a good turn out and a good early test for many in the Racing Snake category! Andy, Joel and Nicky took to the start line and had a good 5 laps to stretch the legs. Joel struggled with mechanicals and pulled out after 4 laps, Nicky had 3 good laps but pulled out on lap 4 not feeling great, and Andy raced as fast as he could to finish 16th! A good event - hopefully more to come! 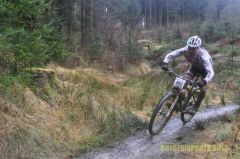 Only Rich Sanchez Samuel made it to Mid-Wales to find a dry and frozen course - but still no dust! He raced everyone in sight and finished just outside the top 10. The Gorrick Spring Series kicked off at Tunnel Hill on Sunday and, for some of us at least, this was the first race of the season. We couldn't have picked a better day. The early fog lifted and gave way to a bit of sunshine, enough to take the edge off anyway. Despite the mostly flooded parking area, the course was in good condition and pretty dry, boasting the usual mix of winding singletrack and a number of little kicks to test the legs. Andy and Ben Jones made it to the start line and with just 3 laps to complete, it was a short and fast race, taking little over an hour to complete. Andy finished 7th in the Vets, while Ben got 2nd in the Masters. 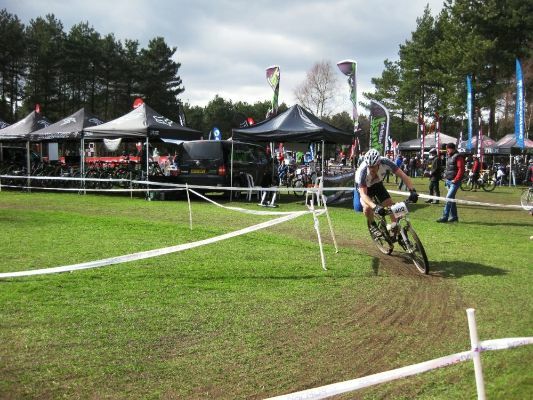 Sunday 3rd February, 2013, XC race. 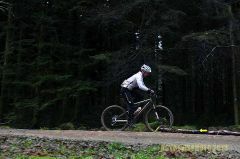 Coed Trawllm MTB centre, Wales, LD5 4TS. A cracking event down at sunny Margam. Rich Samuel entered the 3hr Vets race and finished on the podium as the first Vet, and with an uncharacteristic sprint - managed to pip the 2nd place rider on the line to finish 2nd overall - good skills! 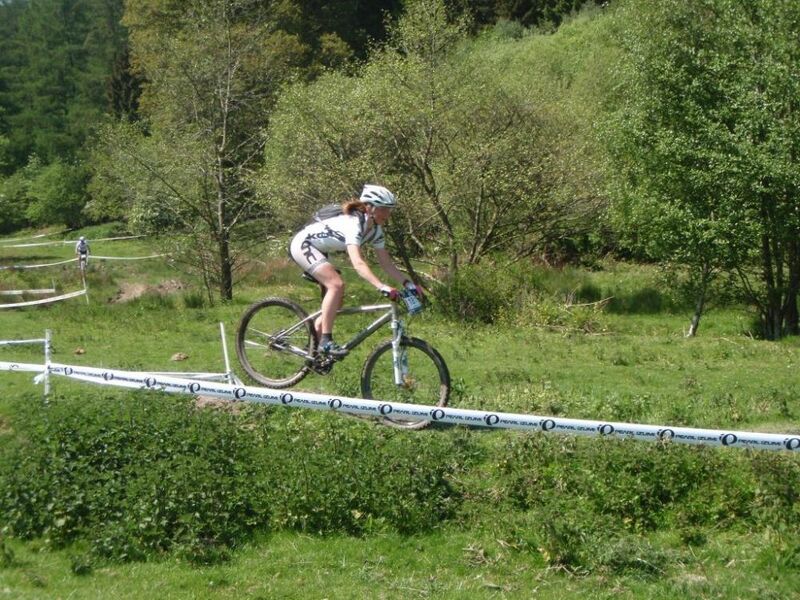 Let's hope the event organisers can put on a few more events at this classic XC race venue! Saturday 15th September, 2012. 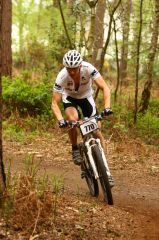 100 Mile MTB Race. Kielder Forest, Northumberland. 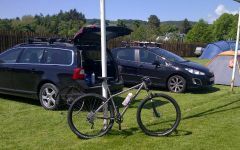 Lloyd and Andy ventured North for the 2012 Kielder100. First time for Lloyd, second time for Andy - who thought it couldn't be as bad as the 2011 race when it rained non- stop from start to finish! It didn't rain - it was dry in the sky and the sun even came out. It was nice to see some of the surrounding landscape - and Kielder Water - which was all hidden last year. It was pretty soggy on the ground though - so the mud was flying! And it was windy!! Most of the fireroads were dry - so the pace was pretty quick and the field quickly dispersed itself into the forest. Andy rode hard for 4hrs but then felt the pace and eased off. Lloyd was a few minutes behind riding at a similar pace. 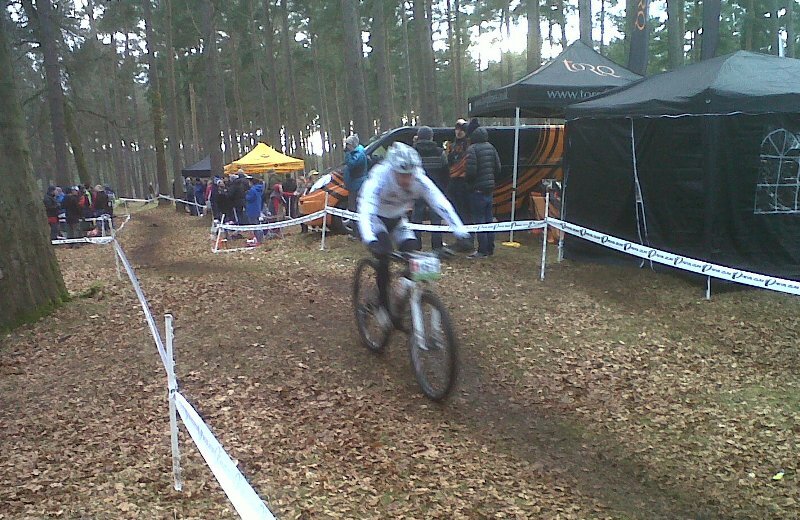 The track over the top seemed rougher than last year - really rough! And the wind was blowing you off the timber sections! But the piper played - and it was much appreciated as we crossed the border. A nice cup of tea at Newcastleton, and the relief of heading home was enough to push to the last feedstop at 78 miles. Here Lloyd caught up and they rode the final 22 miles together. And what a joy that was! The final descent arrived - and Lloyd hit "the wall"! "Just roll down" was the advice, "I can't" was the reply. So a few mintues out and a cereal bar - and they rolled over the line in 9h44mins, in 32nd and 33rd place overall, 8th and 9th Vets. 100miles, 3800m of climbing - a long race! 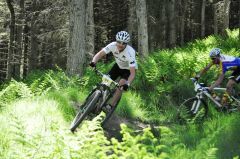 9th September, 2012, MTB Enduro, Brecon, Wales. A beautiful morning accompanied us to Brecon for the 2012 Beast. Ben, Andy, Joel, Rob (with broken collar bone) and Nicky started the ride and headed off to the hills. Dryer than last year - the first singletrack section was great fun, then a linking road section lead us up to towards The Gap. A new section in the woods was also brilliant trail, then nice double track up and over to the resovoir helped to make good time. A tale wind up the Gap was also welcome, and the ride finished at 52 miles. ben was first back in 4h25, Andy broke a chain and finished 3mins later. A great route - even with out the old mountain! A small trip to mid Wales was well worth it! 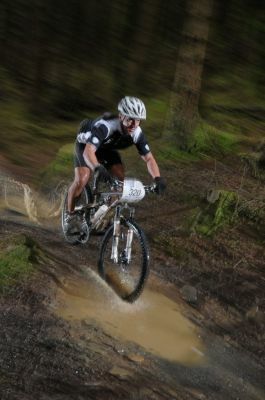 From the organisers of the Real Ale Wobble - this was going to be good riding - and it was. 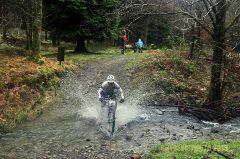 Llanwrtyd Wells is the wettest place in world - and the trails seem as wet in the summer as they do in the water - but with warmer puddles! 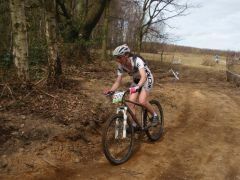 The 80km ride didn;t sounf too tough - but it was! A total of 43miles was enough, the terrain is lumpy, teh technical section in the trees are hard as it's so wet and slippy. But a really good ride - and well organised - try it next year! Rich had spoken to Matt Page about it after beating him in a fell race earlier in the year. Matt is one of those riders who’s wired differently – he can go out and ride at race pace non-stop for 24hrs – an endurance expert. 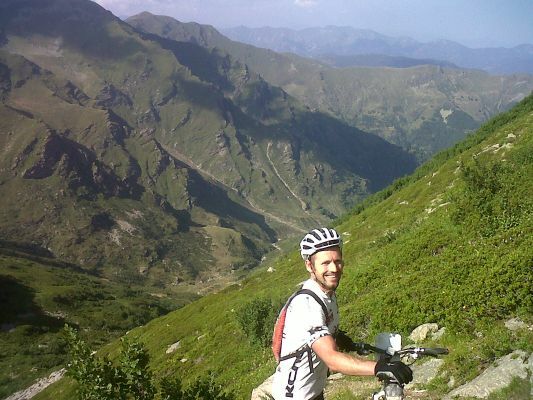 Matt had completed IronBike 2011 - and said it was the hardest thing he’d ever done! With the Sardinia race in our legs 5 weeks previously Rich and I foolishly decided we were in good shape to take on IronBike! We drove down to the Italian Alpine Region of Peimonte, another mistake, and arrived just in time to eat pizza in the delightful finish town of Sauze D’Oulx. We took the bus to the start in Limone Piemonte, sleeping most of the way trying to recover from the drive. We arrived with 45mins to make camp and take the start line for the second heat of the Prologue – 2 laps in the streets of the town, the first 20 from each heat competing in the final. Not much to prove, just a bit of fun, a spectacle for the locals, and the award of leaders jerseys for the start line of Stage 1. It rained for the final so most cruised round to save their skin for the week ahead. There were 8 Brits there – a bit of a surprise! We knew Matt Page was riding again, but we didn’t expect Ricky Cotter, Jon Harris, Chris Purt, Alun Lewis and Saku Saha. Nice to have someone to listen to your witterings! The race format was simple, 7 days, 2 timed sections per day, a target time and a cut off time per day. You incurred 10 penalty points for every minute over the target time, and you incurred 10,000 points and were eliminated from the race if you went over the cut off time. 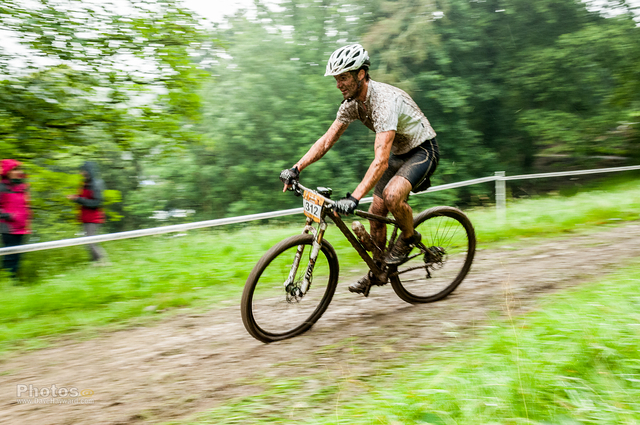 You could still ride – but were not classed as a “finisher”. In the timed Special Stages you incurred a point for every second you were behind the fastest finisher – so if you won the stage you got no penalty points. The one with the least points is the winner! Stage 1, 138km, 4600m climbing, 8hrs target time, 12hrs cut off. Tough on paper, but doable – surely? It rained hard in the morning, the trail was good so we made good speed to the first timed section. Just a climb to 2500m and a descent. It was rough but rideable up to the summit, then a case of carry over the peak and try and ride the descent – loose, rocky, tight switch backs with a load of big boulders to tempt you to ride – but buck you about. The finish of the SS was easy down to the 75km feed stop. The second SS was easier, just a 1000m climb and descent that dragged us up and down. The finish was 110km, so with just 28km to go we set off on a nice gentle spin back – but not on IronBike – another 600m of climbing and then a drawn out road to within 3km form base camp. Surely a tarmac descent to finish – no chance! We dropped down to the river and took a meandering footpath all the way to the end – truly exhausting after 135km and 4600m of climbing. We made it back in 11hrs pretty beat. We’d ridden hard all day and raced the timed SS’s. We didn’t hang about, we stopped at feed stops – you had to eat! A tough day, we made camp in the rain. See Strava for the ride stats. Stage 2 was surely easier?? 110km, 3400m climbing, 9hrs target time, 12hrs cut off. A wet start, sore legs, and a very sore knee, Rich was still grinning – even with sore knees, so we started the 40km climb to the 3000m Mt Bellino. A stony track up seemed ok to about 2000m but then the thin air started to make the legs feel more empty than they did already. The previous night’s rain was snow up here so it was cold, and the cloud cover threatened more! We didn’t see any, but plenty of the riders did! The descent was sticky, loose and snowy – just like a UK winter. We made good time going down even with fingers so numb I couldn’t feel them slip off the brake lever! That SS took 4.5hrs, an easy spin to the next which was just 1700m of climbing and a truly awesome descent that went on for about 10km! 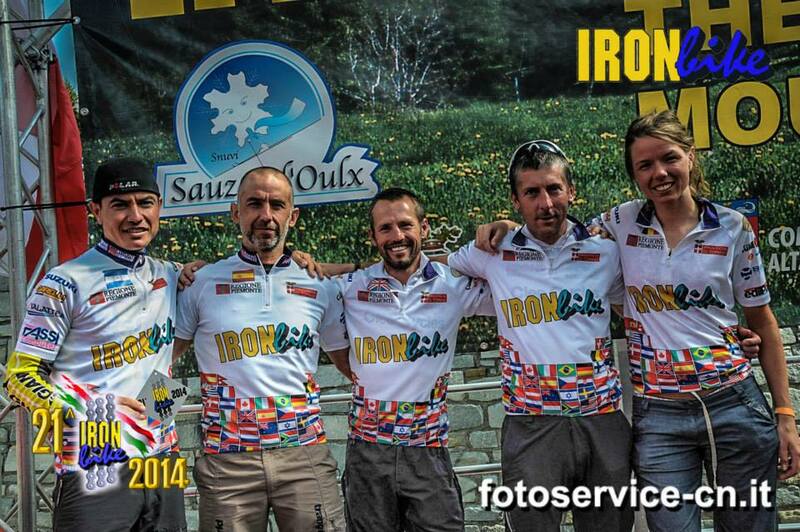 Finished in 9hrs – but they called it an easy day for IronBike! 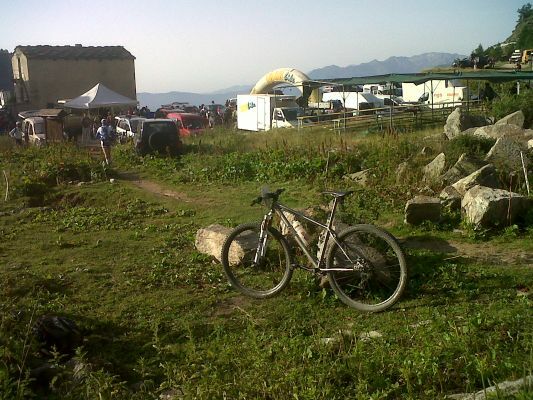 Stage 3: 96km, 4800m climbing, 8hrs 30min target time, 13hrs cut off. It sounded OK on paper..... But what a day! 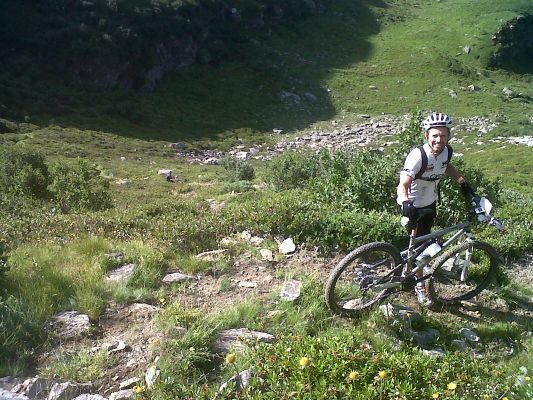 The first SS was OK, up to 1300m with a mega descent that tested your endurance as well as making you grin. 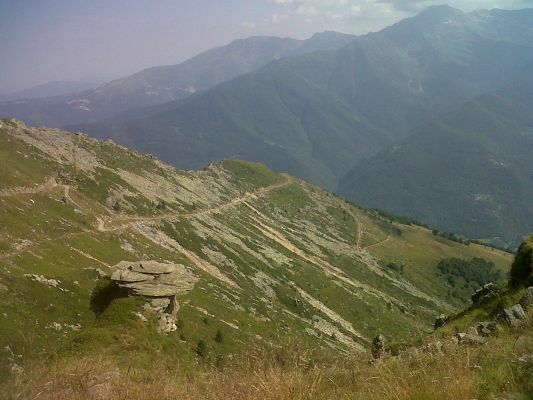 We then had a beautiful Alpine climb over grassy, rocky mountain sides up to the 2400m peak of Colle Chiot Cavallo. 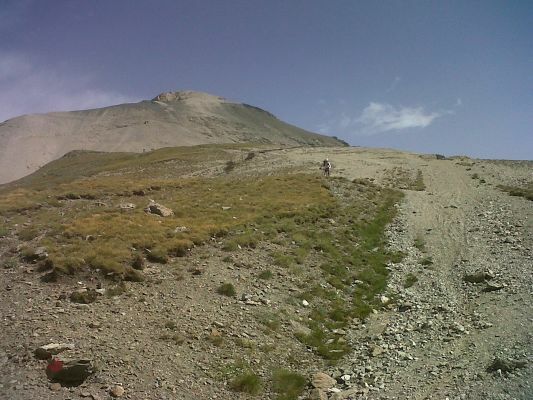 There was plenty of walking – and this was really tough at anything approaching 2000m. We hiked to the top and then had the descent to tackle – technical, unrideable at the top, but ultimately testing on mind and body. We raced into Torre Pellice relived to have finished at all in 10hrs. We treated ourselves to a beer and a pizza later on, after our daily post ride pasta. Stage 4: 100km, 4646m climbing, 8hrs 30min target time, 12hrs cut off. The first SS was typical of IronBike – a big climb and a super technical descent that really tested strength and ability. I was riding well but on a tight switchback a rock grabbed the front wheel and stopped the bike dead throwing me forward. I caught myself but ripped my shoulder in the process – ouch! 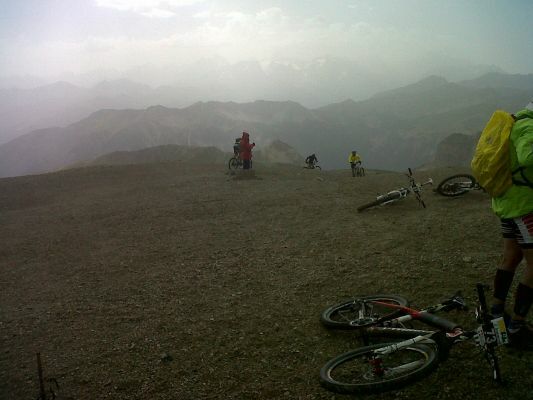 We then rode up to 1600m where the 2nd SS started – with a 2hr hike-a-bike. This was punishing – neither of us walk that well, and not in cycling shoes, and not carrying a bike, and not over rough, rocky goat track. The first 5km took 2hrs! Then a climb up to 2700m. That took 8.5hrs, 60km total distance. We then descended on to the top of a ski lift, skidded down couple of black runs on to the top of the bike park descent – a full on downhill run that really pumped your arms and brakes! The descents were now as punishing as the climbs – your whole upper body took a beating, not just for minutes – but for hours every day. From the valley floor we then had to climb back up to 1600m and then another descent down to the 97km point on the Garmin. Some rough grass and mud lead to me nose diving into a soft spot and ripping something in my shoulder – this made descending impossible and riding was getting unbearable. We had been riding for over 11hrs now and just wanted to finish. 3km to go – an easy roll home? No – a 3km scramble up an ancient rocky trail to the finish. We made it in 11h50m – just in the cut off. Nobody made the target time, 20 odd riders had already pulled out and about half the remaining field missed the cut off. So they extended the cut off to 13hrs! It didn’t affect us – we’d struggled to finish the day in 12hrs, we didn’t want to out there any longer. We were both finished, sore knees from walking and my shoulder was agony! The start the next day was 7am, breakfast at 5:30am. We didn’t think we’d make the start line. I lay in bed feeling sorry for myself when Rich shouted from his tent “Andy, you awake? I’m starting tomorrow”. “I can’t” I replied. Stage 5 – I hadn’t slept at all because of the shoulder pain, so when everyone was getting up at 5am I thought I may as well too! Some anti-inflammatory, a cup of coffee and a hobble around made me feel better, but no sign of Rich concerned me. I shook his tent a bit more until his ear plugged head popped out. “I can’t ride” were his first words. I said I’d help him get ready so he agreed to try. I ate breakfast while he faffed, then decided if Rich could ride so could I – so set about readying myself. We made the start line with minutes to spare – and surprisingly – the more we rode the less pain we felt! An easy climb up to 1600m helped, then a fast descent to the valley and the start of the SS in the Mine. It’s a 2km tunnel less than 5ft high and with a narrow gauge train track in the middle. It’s pitch black, and there are rail junctions to cross – which are lethal. The craziest race I’ve ever tried! We then started the big climb up to 2150m in the sunshine. 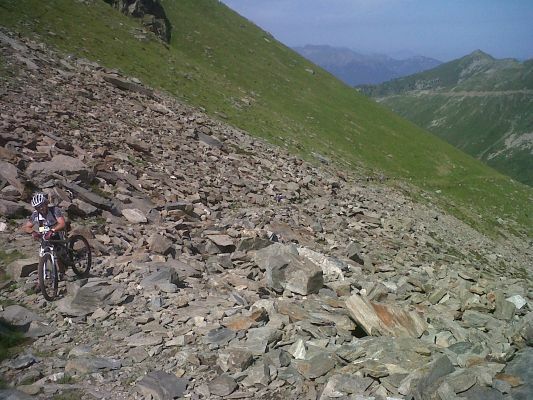 This was another typical alpine climb, with the last 3-400m of ascent being walking and scrambling with the bike aloft. The descent was unrideable initially – but then it was tight switchback and loose rocks all the way down. We then passed mountain side forts before climbing steeply up to Fenestrelle Fort, then a steep switchback climb before the track up to the base camp -Rifugio Selleries at 2032m. We finished at 4pm so had a couple of hrs to relax in the sun. Rich was suffering from blisters on his hands – a few cotton threads through them and some soft bandages helped no end! Having finished the day with in the cut off – we now felt relive as we knew we could finish the race. Our tactics had changed from riding easy and racing the SS’s to riding steady all day to beat the cut off. It seemed to be working! Stage 6 – it gets crazier! 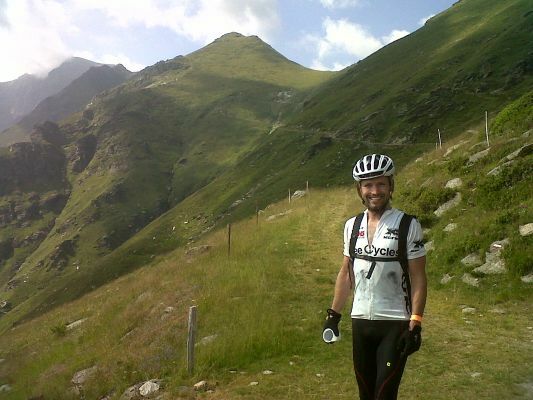 100km 7hrs target time, 10hrs 30min cut off The first SS was down through Fenestrelle Fort – from top to bottom. Most of it was steps, 3000 in total, some of it inside dark tunnels. The steps were rideable – but so steep it was difficult holding your speed to stop yourself accelerating out of control. Talk about arm pump! I rode the first few flights but had to run a set just to give my arms a rest. I survived; unfortunately fellow Brit Matt Page didn’t, having to stack his bike on the final flight of steps to avoid the wall at the bottom! We then had a ride up to the ski lifts where we took a chair lift up a few hundred metres to safe our legs for the big mountain to come – Mt Chaberton. This chair lift was the most peaceful part of the week – a few minutes sat in a comfortable seat in the sunshine! Then a scoot down to a gondola and up again to fit in a mentally steep descent to the SS start at the base of Mt Chaberton. This started with a steep track winding its way up. At about 2000m it was barely rideable, and the path got very narrow. 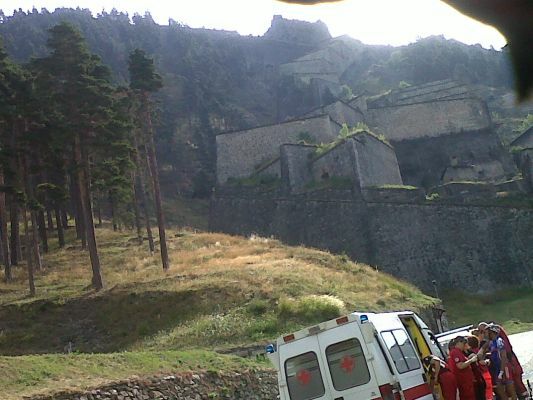 Luckily there were some mountain gendarmes to watch you fall! As we reached 2600m the clouds rolled in and it got cold, then rained, then sleet. The wind blew you about which made in impossible to balance. I put a jacket on and decided I had to keep moving to keep warm – so continued to the top. 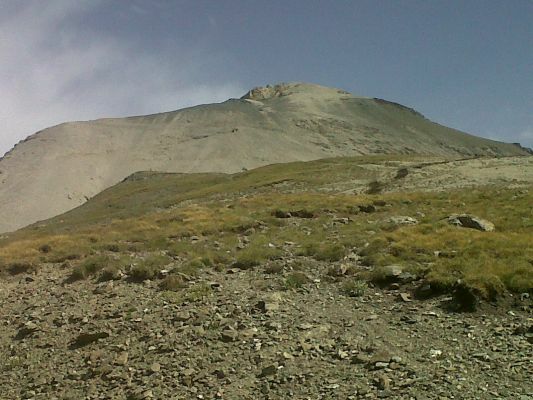 At 3100m it is extremely exposed on the top – and there was a feed stop with a kind lady serving coke! That climb took 2h50m; the leader did it in just under 2hrs! It was too cold to stand around so I headed back down the same route avoiding oncoming riders/walkers. The French authorities had now closed the mountain so riders were held lower down and told to wait. I waited for Rich and we quickly descended the mountain. We then ended up in a deep gorge walking and riding boardwalks and steps, then spot of xc riding before taking another gondola up and climbing the last few hundred metres up to Sestriere at 2100m We beat the cut off by 10mins! Stage 7 – the final day. 58km, 3400m climbing, 4hrs 30min target time, 6hrs 30min cut off. A gondola ride up to 2700m with a SS descent of 1200m in the rain – just like home! Mud and grit flying everywhere it was fun, but a struggle to flick the bike around with only one useful leg! The second SS was a 900m climb followed by a similar descent, fairly tame by IronBike standards – but at this stage it was enough. We descended with fellow Brit Jon Harris, and for the first time in the week missed an arrow and got lost. We found our way back on course so didn’t lose too much time. Then the few kms to the end – surely an easy finish? No – undulating single track with a just rideable 400m climb which we hoped would be the last. No – we descended some more, then climbed and climbed, eventually reaching tarmac and a nice 1 in 4 gradient to the end. Finished in the cut off time – so we were IronBike finishers! Andy finished 23rd from 109 starters, Rich finished 29th and with our respective injuries we did well to finish. 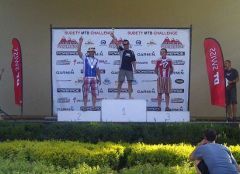 Ricky Cotter won the Womens IronBike 2012 - well done Ricky! 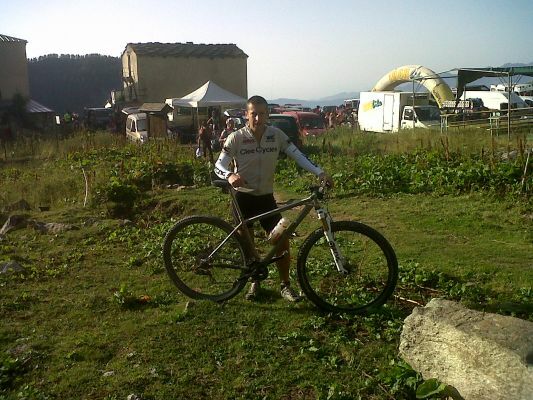 No complaints - IronBike is incredibly hard, tortuous at times. They make it hard, that’s the point. The descending is as arduous as the climbing! 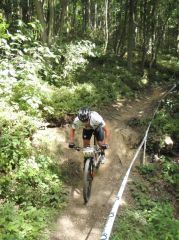 But there is some fantastic riding – both mountain climbs and descents, technical xc trails, very technical descents, ski lifts, ski runs, downhill runs, mines, tunnels – it’s got absolutely everything! 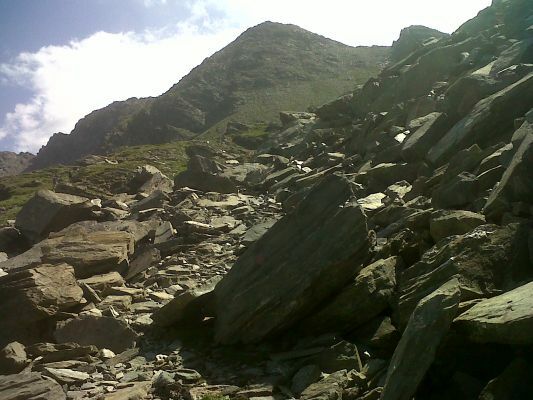 But it has got walking/hiking/scrambling – and that is hard – especially if you don’t normally do a lot of walking! 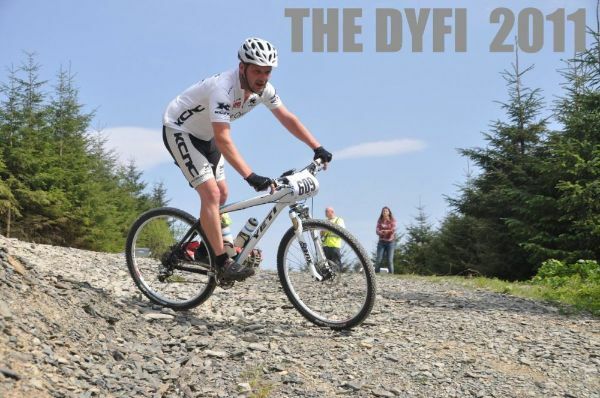 To bring in a UK perspective – the Dyfi Enduro is tough – but has about 1800m of climbing. The Torq Rough Ride is hard – it has 2100m of climbing. There’s no walking in either! IronBike has 2-3 times the climbing every day, and a lot of it at altitude, and plenty of carrying the bike! For a quick glimps, and some Black Sabbath, check out Matt Page's video clip IronBike 2012 here. A week on I’m still recovering from damaged muscles, but the more they heal the more I enjoyed IronBike. Would I do it again? Not now, not at this minute, but it certainly is a challenge! May be we’ll start training now for next year? The MET Office put out a severe weather warning for the South West over the weekend of Twentyfour-12. Not exactly ideal conditions for a 24hr race. And they weren't wrong - it rained! Still, Twentyfour-12 is one of our favourite events of the year and once you're wet, you're wet, right? How bad could it be! 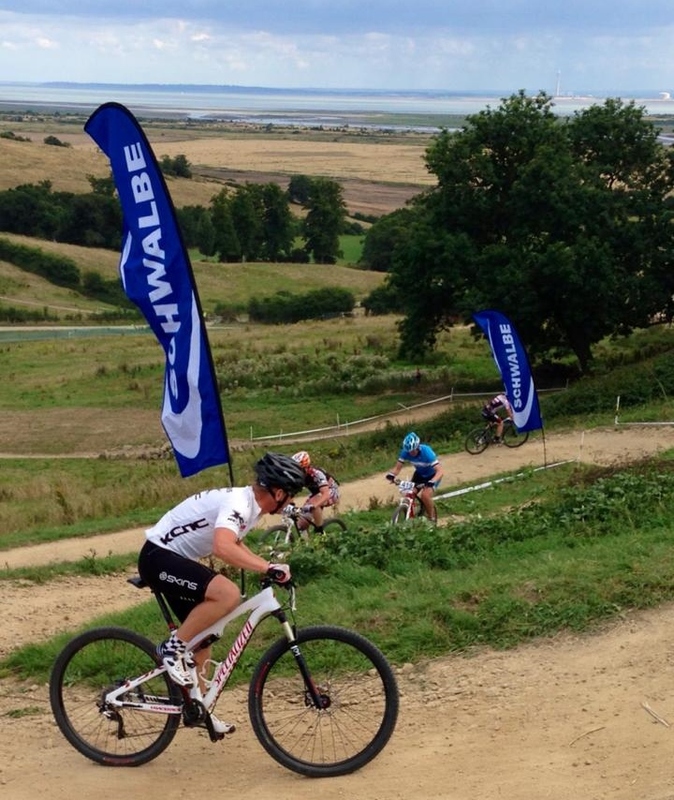 Ben Jones and Dave Winter paired up again, for Clee Cycles, to take on the men's 12 hour race. After a good start, the Clee team were locked in a three-way battle with Certini/McCaulays and Shred. And the race settled into the usual routine of riding, cleaning your bike and trying to eat. 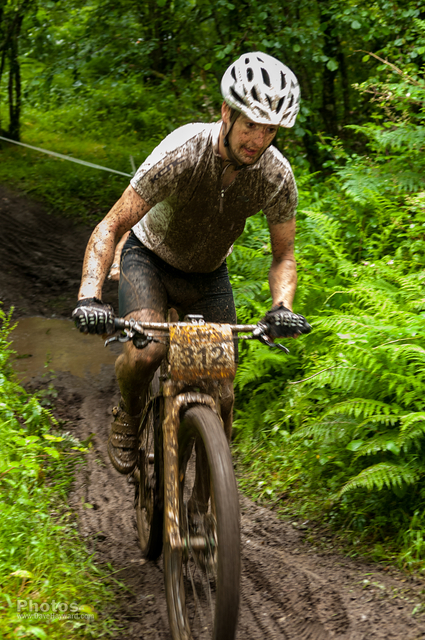 As the race progressed, the course cut up, the mud got worse and the lap times slowed. 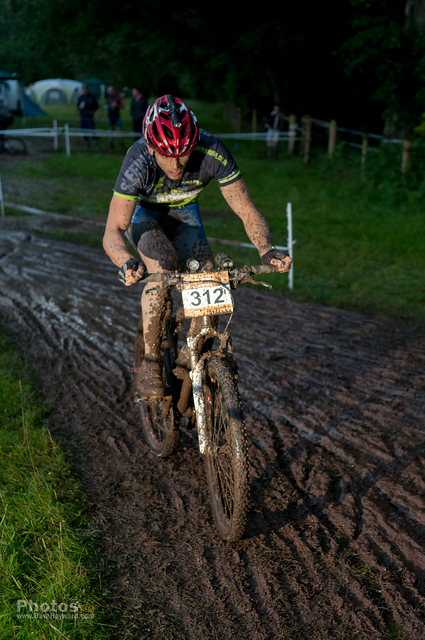 All credit to the race organisers, who monitored the course conditions throughout and put in diversions when sections of the course became completely unridable. With just under eleven hours done, the Clee team were secure in second place, ahead of Certini, just 11s behind Shred and closing fast. A mechanical issue halted Shred's progress and a quick lap by Dave, to get back before the 12 hour cut-off, allowed Ben to get out one last time. The clee team finished the race muddy and exhausted, but 1 lap clear of Certini in second, to win the Men's 12 Hour Pairs race. 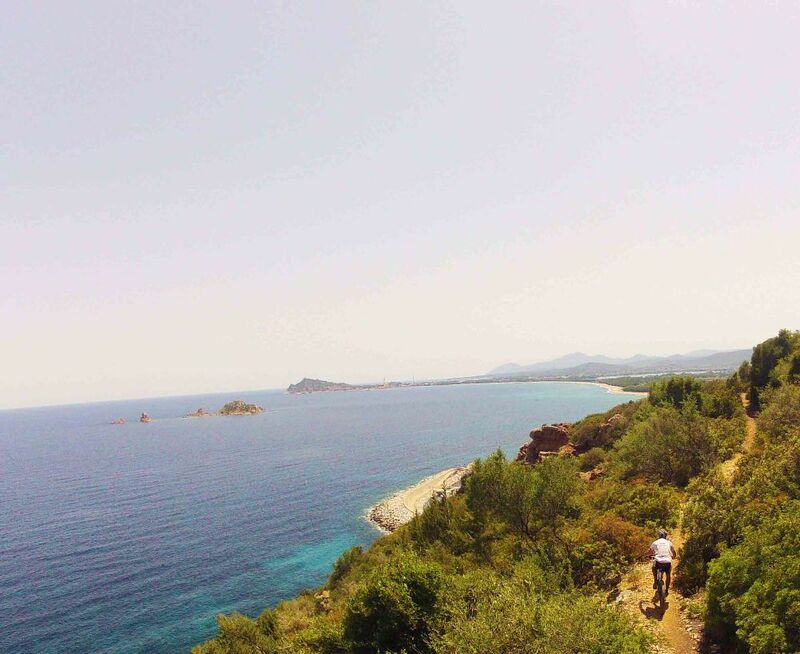 The Clee Cycles Race Team sent Andy, Ben, Rich and Joel to the Trans-Sardinia stage race in search of some racing in the sun! And we got sun, and mountains, and rocks, and dust, and cuts and bruises - and prizes! The Race started with a prologue in the starting town of Arzana, a showpeice for the race with 6 shorts laps around the narrow streets and steps! The Stages consisted of a single timed section of approx. 40km within each days total course. The fastest time each day receieved no points, every second after the fastest time incurred one point. There was a time limit on each day, each minute over the limit incurred 10 points. The rider with the least points is the leader. Simple!! See www.rallydisardegnabike.it/news for stage reports. The days were all hard, some very hard. The timed sections were over 3 hrs long. The trails were exceptional, but brutal at times! There was a lot of climbing, and it was hot! The cut off times of 7hrs seemed easy - but were not always beat! Day 2 was Stage 1, no time to aclimatise - a 5km climb to the start of the Special Stage, then 49km of racing with 1650m of climbing. The heat took its toll with all of us fading at the end, but we all finished within 10 mins of the winner. I nice 2 course lunch followed with a 40km ride back through amazing landscapes around Ulassai. 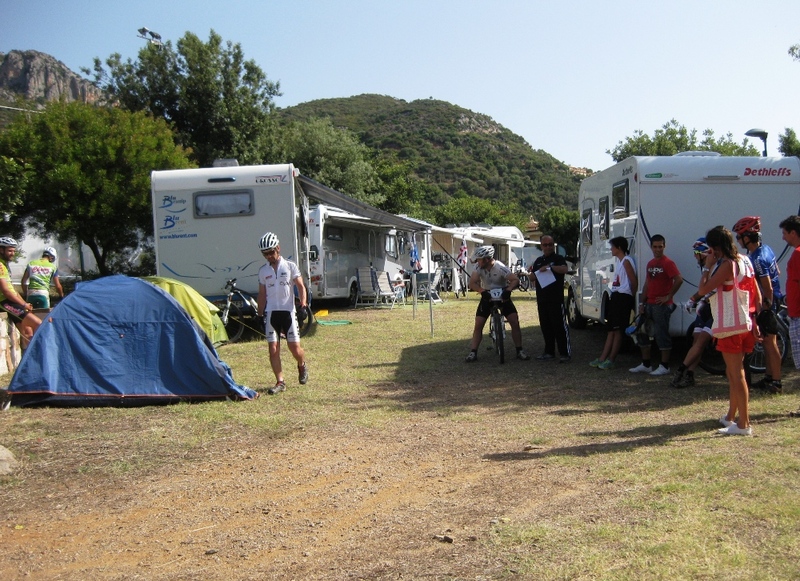 Stage 2 was the longest at 110km with the 42km special stage taking the highest mountain in Sardinia at 1850m. The 36km ride to the start was tough enough with the intense heat, the climb to the summit was rocky and technical, with the last 4km unrideable in places! The top was in cloud and cold, but the 10km decent down the otherside was one of the best ever! Andy had a good day and managed to pass the leader on the descent and somehow managed to win the stage, and take the leaders jersey in the Over 40 Class - see Stage 2 News - ahead of Spaniard Miguel Alzina. Ben strugggled in the heat and finished exhausted and sick! Joel and Rich recovered and finished the stage well. Stage 3 was 76km with a 29km Special stage with 830m of climbing. Easier on paper but another tough day in the saddle, with an endless switch back climb before the final descent. Ben sat the day out with illness, Andy completed the stage to retain the leaders jersey, Rich and Joel climbed a place in the overall classification. Stage 4 was 55km with a 31km SS, again a tough day in the sun with a nice rolling finish. Andy kept the O40s lead, Ben got back on his bike and finished the day feeling more alive. Stage 5 was 78km with a 58km SS from the start. 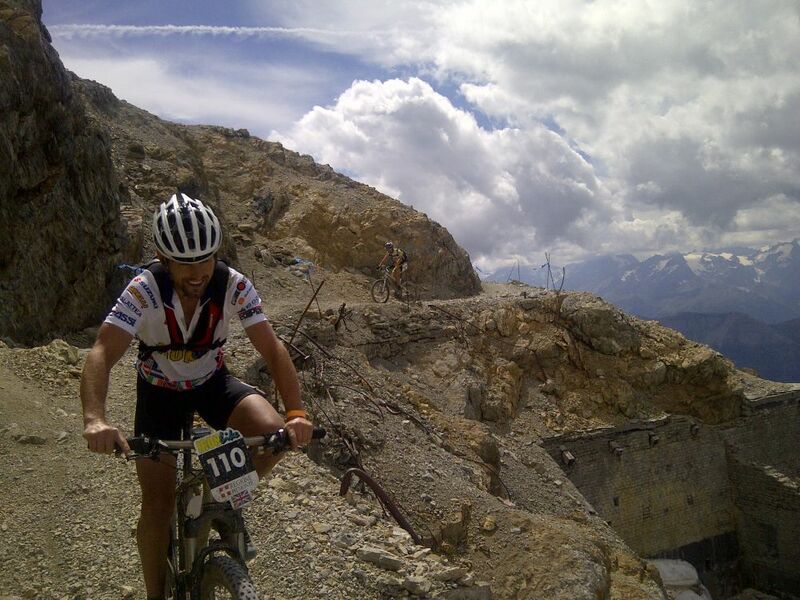 The stage descended nearly 1000m, but was anything easy! Loose scree littered the trails and hairpin descending was precarious and dangerous at times! The scree turned to rocky slabs and we finished through woodland on to the beach. Then a climb through a white sided ravine that was nearly cooking temperature for us Brits! That was difficult enough, but when we descended to the beach for the second time at the end of the stage we thought it was done, but a final 6km coastal path proved to be the hardest part of the day. A treacherous path, barely walkable in places, became lost in a landslide. The resulting boulder field had no markers and everybody lost time looking for a route out. Andy went over the cut off time by 12 mins and the penalty points meant he lost the lead to Miguel Alzina. The final stage 6 was suitable short at 41km with a 16km SS - but weary legs meant Andy couldn't beat Miguel Alzina by the required minute - so Andy had to settle for 2nd place! The finish was on the beach and a well deserved swim was had by all! The week was superb, well organised, the food was a delightfull mix of local recipes and wine, and Italian pastas. 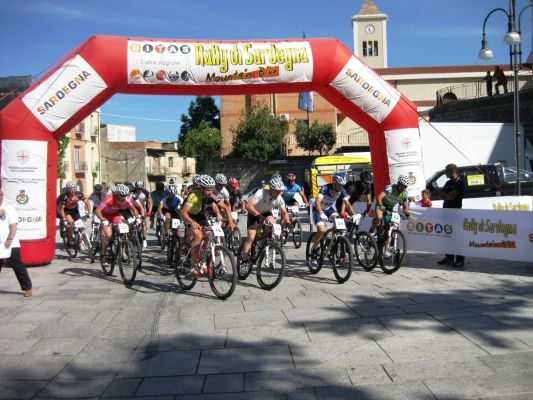 If you want some sunshine and top mtb riding and racing - try the Rally Di Sardegna! 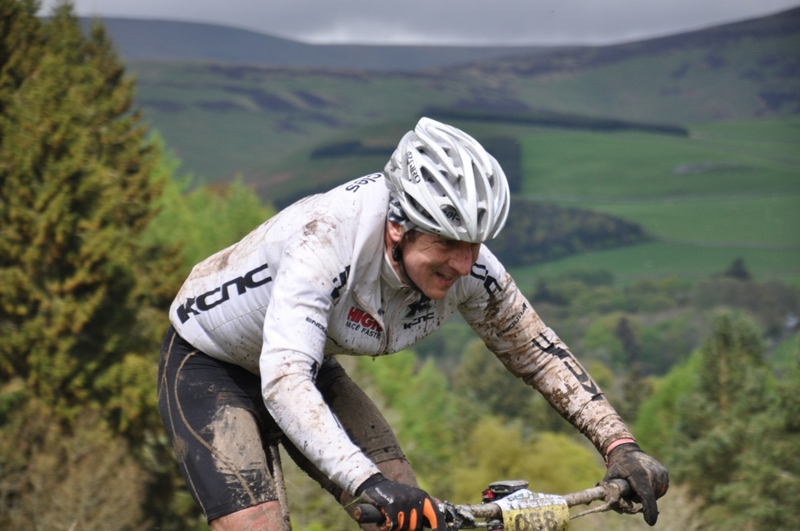 In contrast to last year's event, the 2012 Torq Rough Ride was hot and bathed in sunshine. Five Clee riders made the start. Well four to be exact; Andy was still on the toilet when the gun went off. The 75 km course, which was full of moorland trails, was dry and quick, but with over 2000 m of climbing, was still pretty tough. There was also a fair breeze, which made for a good headwind! The hot weather seemed to both help and hinder the riders, where the dry conditions made the climbs just a little easier. But some riders, especially those who who left their bottles at the feed stations, twice (Rob), suffered a bit in the heat. Ben Jones was first man home in a time of 4hr 8min, closely followed by Andy Jones (4hr 12min), Rich Samuel (4hr 28min), Dave Winter (4hr 31min), Rob Brickley (5hr 34min) and Nicky Morris (5hr 54min - on his first outing for Clee - what an event to choose!). A good, long, and hot (rough) ride! 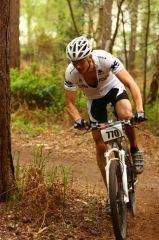 CRC MTB-Marathon Series Rd 2 19-20th May, 2012. A lot of rain on Friday meant a damp start to the UK Marathon Champs Race, but bright blue skies were welcome as 101 riders lined up for the 85km single lap race. 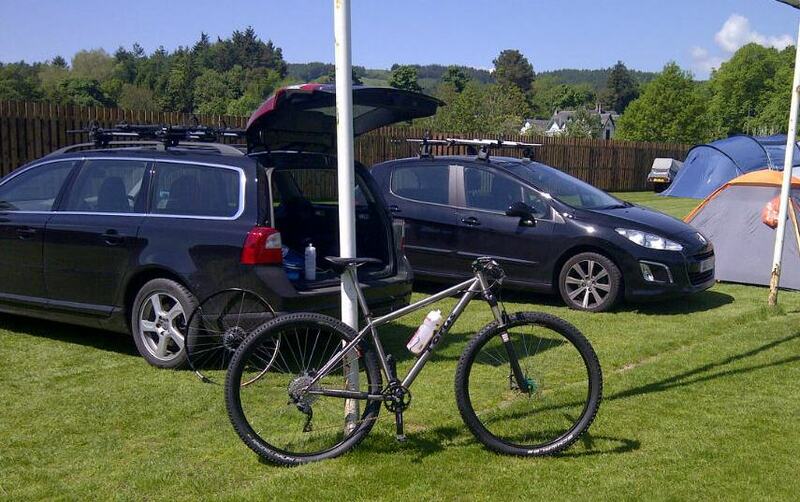 the course was typical of Selkirk with some big climbs, rough stone tracks, grass, bogs and slimey rooty single track. Oh, and a blast round Innerleithen with the climb to the summit of Minch Moor! All good riding, and really good to race on. Andy and Lloyd made the trip and lined up in a pretty tastey field of Vets and Senior riders. The field bunched up close during the first couple of neutralised miles, but it quickly stretched out as the first climb came in very quickly, and a good 15-20mins! Positions changed a little during the first hour - but soon settled as the leaders disappeared and everyone found their own pace. 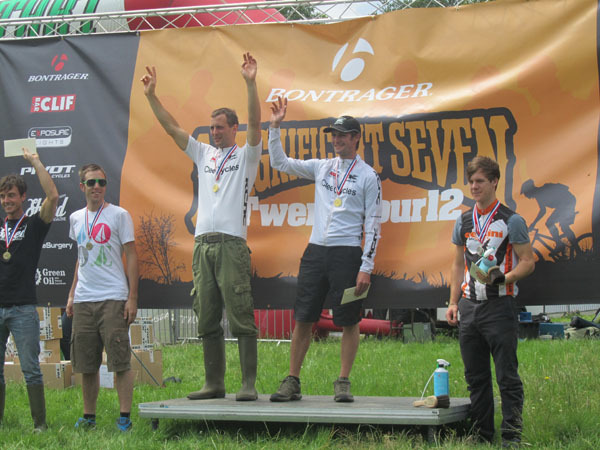 Andy was first back in a time of 4h02, and in 7th place in the vets, 25th overall. Lloyd came in in 4h15 having not felt good all day.